I won’t lie: I generally feel — being a Jewish kid from suburban New Jersey — about the least qualified person on earth to talk about biscuits. My grandmother didn’t make biscuits. I am almost certainly the first person in my family to keep my fridge regularly stocked with buttermilk. And growing up, our breakfast breads were a rotation of Thomas’ English muffins, bagels and maybe corn/blueberry or bran muffins, so it’s not like I have a deep well of biscuit nostalgia to tap into when I decide, on a whim, that what our morning, slicked with heavy snow, really needs is freshly baked biscuits. Odds are, however you make your biscuits, you’re making them wrong. Either the flour isn’t right (all-purpose when it should be White Lily, cake flour or something equally delicate), the leavener is unacceptable (commercial baking powder instead of a homemade blend of baking soda and cream of tartar), you chose the wrong fat (shortening instead of lard, lard instead of shortening, butter instead of shortening or lard), you pulsed your fat into the flour instead of rubbed, you beat instead of rolled, you dropped instead of cut, you used a cookie cutter (gasp!) instead of a juice glass. I’m totally cool with this: I make my biscuits wrong, too. Even by my own standards. There’s a general formula I associate with most biscuit recipes, roughly 2 cups of flour to 5 tablespoons of fat and one cup of milk (or sometimes 2 1/4 cups to 6 tablespoons and 3/4 cup), but despite my every effort to love the results of this formula above all else, I failed, reverting to a random version I’ve been making from a diner in Colorado that I found in Bon Appetit in 2000, nearly as far from known biscuit country as one can roam. 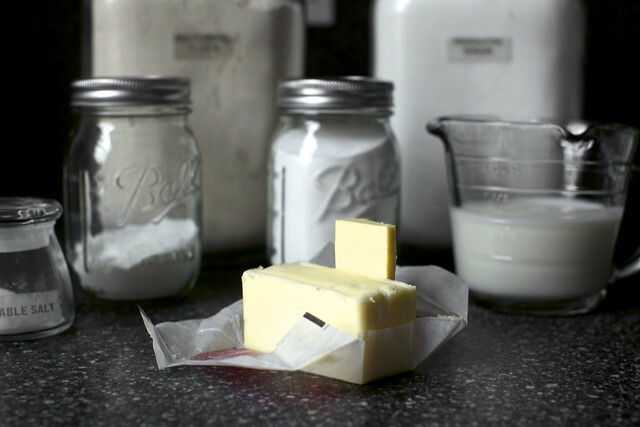 Its formula — with two leaveners, buttermilk instead of milk and a much higher proportion of butter — isn’t even close to the classic and it’s not even a little sorry. Because they are awesome. I mean, every single time I make them, I too am confused as to how I became someone who knew my way around a biscuit. It’s not in my bones, it’s not in my history (yet), it’s and so it must be the recipe, which is the best part: that means they can be yours this weekend too. Biscuits, previously: Cream Biscuits (the easiest biscuits in the world) and Blue Cheese Scallion Drop Biscuits. Lots of biscuits and scones in the archives as well. I shared these on the site way back in its youth, 2007, but I’d adapted them as chive biscuits and it was buried in a post without any photos of their deliciousness. They never got the spotlight they deserved. These can be adapted in a lot of ways. You can use (unleavened) cake flour for a more delicate biscuit, add herbs or a little grated cheese for a different flavor profile, and the sugar can be dialed up or down (the original calls for 1 1/2 tablespoons, but I use as little as 2 teaspoons when I want a savory biscuit). You can make your own buttermilk (like so) or whisk together yogurt or sour cream and milk for a similar effect. They can be dropped from a spoon or cut into shapes. The original recipe has a larger yield (12 standard), but for our weekend needs, but I’ve taken to scaling it to 3/4 of its original volume (shown below), which will yield 6 very large breakfast biscuits (think: egg sandwich, and then invite me over, please) or 9 standard ones, the kind you’d serve alongside other things (although they will totally, unapologetically hog the spotlight). Heat oven to 400 °F and cover baking sheet with parchment paper. Whisk flour, sugar, baking powder, salt and baking soda in large, wide bowl. 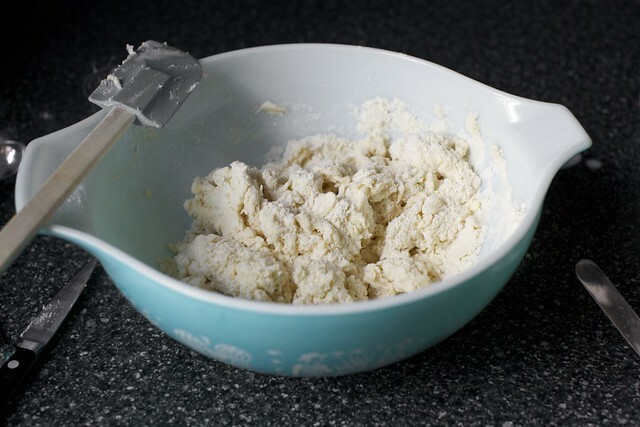 Using fingertips or a pastry blender, work butter into dry ingredients until the mixture resembles a coarse meal, Add buttermilk and stir until large, craggy clumps form. Reach hands into bowl and knead mixture briefly until it just holds together. To form biscuit rounds: Transfer dough to floured counter and pat out until 1/2 to 3/4-inch thick (err on the thin side if uncertain, as the tall ones will literally rise and then tip over, like mine did the day I photographed these). Using a round cutter (2 inches for regular sized biscuits, 3 inches for the monstrous ones shown above), press straight down — twisting produces less layered sides — and transfer rounds to prepared sheet, spacing two inches apart. To make drop biscuits: Drop 1/4-cup spoonfuls onto baking sheet, spacing two inches apart. Both methods:Bake until biscuits are golden brown on top, about 12 to 15 minutes. Cool slightly, then serve warm, with butter/jam/eggs/bacon/sausage and gravy or any combination thereof. Happy weekend! Do ahead: Biscuits are best freshly baked. When I want to plan ahead, I make the biscuit dough and form the individual biscuits, then freeze them until needed. They can be baked directly from the freezer, will just need a couple more minutes baking time. THANK YOU. perfect food for this cold windy week in Baltimore. Buttermilk biscuits are the best! These are beauties. If these biscuits are wrong, then I really don’t want to be right. I’m picturing a biscuit based eggs benedict. Yum! This (Boston) weather is making me want run home and make these and sit by the fire :) They are beautiful, you look to be more than qualified to make biscuits. I’m so excited. I have some buttermilk leftover from making cornbread for the snow event that never arrived here in DC, so this is perfect for this weekend! Thanks! Deb, I was born and raised in North Carolina and learned to make biscuits at my Mama’s knee. These look wonderful. Since, I was raised in the south, I will sacrifice myself and make this biscuit recipe. The things I’m willing to do for carbs. Wow, these look tasty! We love making buttermilk biscuits. We’re definitely going to give these a try. YUM. I don’t prefer drop biscuits, but am still lazy, so I’ve given up biscuit cutters completely and just use a board scraper now to cut the dough into 12 pieces. Nothing wrong with a square biscuit! Your timing is impeccable. There are a billion biscuit recipes out there, I was looking for one that is tried and true and loved. Will have to try this recipe this weekend! Happy weekend indeed! I can imagine a bacon sandwich with these would be totally epic. Just to clarify, is the recipe shown the “original volume” of 12, or is it your adapted 3/4? Thanks! Love biscuits!! With apple butter, most always. Delicious. I love your biscuits and scones and are delighted to have another recipe to add to the collection. Can’t tell you how much we also adore the wild rice, kale, caramelized onion gratin from the cookbook. I seriously make a double batch once a week to keep the husband happy :). Yum. As someone who didn’t grow up with biscuits either, I’m in favor of making them however they taste the best, traditional or not. Love these! Now I need a biscuit cutter. I thought you had already conquered biscuits…I love your cream biscuits. how are these different or better? Biscuits are my weakness and I make them wrong too :) I’ve been doing an egg wash on the tops lately and pretending that somehow makes them more french and refined. Ha! I’m dreaming. These look incredible. I’ve been looking for a good buttermilk biscuit recipe for the next time I make my dad’s sausage gravy. plus, the cream ones are easy…I *hate* using a pastry blender. my least favorite kitchen tool/task. DESPISE it. The biscuits are gorgeous, of course, but what I really want is that blue mixing bowl, please. Deets? Shiri — It’s my mom’s old Pyrex bowl. She was going to throw it away. Can you imagine? amy — The cream biscuits are the easiest biscuit. They’re good. But these are my favorite in the classic sense — big crumb, layers that separate, buttermilk tang. I think of the cream biscuits more as dinner biscuits, and a great recipe to have in your back pockets. These are what I make when I want my biscuit ideal. Katieliz — This is the 3/4 volume. You can follow the link under the title to Bon Appetit for the full scale. Seeing your bowl made me so happy. I especially remember making chocolate chip cookie dough in the Wedding Bowl a lot. I see a Chez Pim jam in the background! NOM! Thank you! Can’t wait for tomorrow morning! Aha! I’d been racking my brain about which food blogger I’d read who also dealt in homemade jam, and your pic refreshed my memory! Thanks for that! And for these decadent looking biscuits, just in time pour le weekend. Oh hey, you too use Chez Pim jam! That’s my most favorite ever! This is the way my grandmother used to make them! There really is no other way then to use buttermilk. Mmmm! Any info about whether these freeze well? I need to finish up a larger container of buttermilk and these seem like the perfect way to do it. Are biscuits the same as scones? For us in the UK-biscuits are what you call cookies, but these look like scones to me and as an ulsterwoman scones should always be made with buttermilk. I’ve been looking for the best recipe for buttermilk biscuits since ever, so you can probably imagine how thrilled I am to try yours! I already know this will become my number one, since all your recipes are always soooo good! Deb, please let your mother know that the next time she wants to get rid of perfectly beautiful old things, there is an entire internet ready to take them. Yum! These look so good. I’m from Northern NH (not a biscuit making place) and my mother used to make biscuits from Betty Crocker’s cookbook. After reading Natalie Dupree’s The Art of Southern Cooking, I’ve come to learn just how seriously the South takes their biscuit making and that there is definitely a very right way to do it, and it’s not the way I learned haha. I’ve been trying for years to re-create my mothers biscuits- unfortunately as many times as I saw her make them, she never actually measured anything, so no real recipe she could give me. I look forward to trying these to see if they meet the mark! Ok, you. Sausage gravy next, please! (I am the southerner who’s still making mine from a mix, hangs head in shame.) If there wasn’t a foot of snow on the ground I’d be headed out for some buttermilk and Jimmy Dean’s so we could have a biscuit n’ gravy dinner! And anything with Chez Pim jam instantly becomes incredible! This recipe is a little bit of a pain in the neck, by using just over a stick of butter: 2.25 cups flour and 9tbs flour is 9/8 of what would make it easy. Cutting it to an even stick of butter and 2 cups of flour, though, make a fractions equation out of the rest of the ingredients: 9-18g sugar (2 scant to 3 rounded tsp), 13g baking powder (2 2/3 tsp), 4.3g each of salt and baking soda (2/3 tsp), 2/3C buttermilk (156gm). You are doing one thing right – mixing in Vintage Pyrex ;) Love it! Cuisinart with steel blade = perfect cutting in butter every time. It’ll rock your world. Substituting half whole wheat flour makes the dough incredibly sticky and drier; and gives the biscuits a fantastic nutty flavor afterwards. I will be trying these for sure! I grew up with your bowls and love them :D I’m now on the hunt for a set! I’m not really a biscuit kind of girl but these look soooo good! I have to give them a try! Kudos on these pretty things. And if this recipe keeps one person from popping another can of “biscuits” then a job well done. I’ll enjoy mine with that overly sweet peach or strawberry freezer jam, please. No need for a pastry blender if you grate frozen butter with a box grater and then re-freeze it for 5 minutes. Plus, it makes the biscuits lighter and fluffier! There’s absolutely nothing I like making more than biscuits! Gotta try this recipe – doing it this weekend!! I’d say you’re as qualified as anyone to talk biscuits. These look sensational! I always like a good biscuit recipe…they are so adaptable for any occasion! Having had some legit biscuits (Paula Dean’s at lady and son’s etc), I am always on the look out for yummy ones to make at home that are reliably good. This shape of Pyrex is called a Cinderella bowl; the pattern is Butterprint. Lisa — Thank you! I have found it nearly impossible to use any other bowl since I rescued it. It’s so light and wide, and the spouts make everything easier (and double as handles). joelfinkle — Yes, I considered this. In short, I decided that a single extra tablespoon of butter would be less annoying than leavener levels (1/3 teaspoons) that most spoon sets aren’t set to. 2 1/4 cups flour is used in roughly half the biscuit recipes out there, so I didn’t think it would be a concern. That said, no reason not to scale this as it would be easiest for you. Your biscuits will either be slightly smaller or perhaps yield 8 instead of 9. 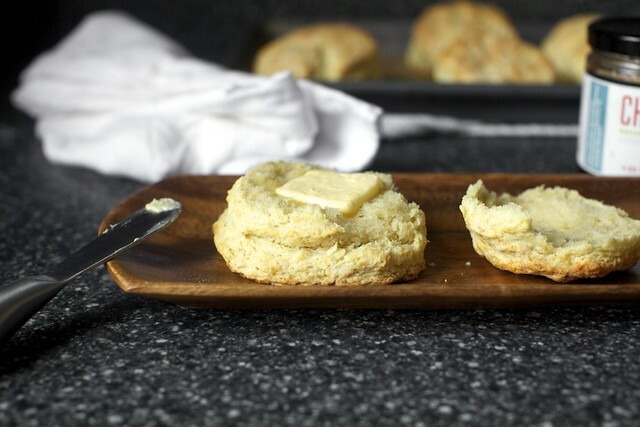 Biscuits versus Scones — They’re not terribly different. I make scones with cream and a bit more sugar. This is my go-to recipe. Biscuits are usually used for savory purposes — barbecue, eggs, sausage gravy, or as I did, with butter and jam. More biscuits and scones — A large archive of them, in fact! Freezing — When making these to eat later, I like to freeze them unbaked. You can bake them right from the freezer for a couple extra minutes when you’re ready to eat them. Biscuits are best freshly baked. Perfect timing! I have beef stew in the slow cooker and these will go perfectly with it! Just bought buttermilk ( I love the REAL stuff) for Irish Soda Bread, and what could be better than having more uses for it all in one weekend??? Serendipity at its finest~ biscuits with jam and soda bread with butter!! Yummo. P.S.”The shark”, by the way is obviously taking his new role very seriously…they never sleep or stop moving, and he seems to be doing admirably with this concept. He is to be congratulated for his authenticity! I may be southern but I’m happy to take biscuit making lessons where I can get them since I grew up on horrid canned biscuits. I’ve made the original Dot’s Diner recipe you posted several times…except I added crumbled bacon and cheddar for divine Bacon Cheddar Chive Buttermilk Biscuits (known by my coworkers as Kitchen Sink Biscuits) They always turn out great and freeze (unbaked) well for months. Thanks for the update and the reminder to make biscuits again! I DO have a biscuit heritage. My mother-in-law made biscuits that nearly floated off the plate, they were so very light. You could eat a plate full before you’d realized how many you’d consumed. This is pretty close to her “recipe” (she never measured–60 years of biscuit making and there’s no need to) except she used Crisco instead of butter. I never bothered to learn to bake them simple because I knew I’d weigh 300 pounds if I was successful. But, boy, do I miss them. Wonderful! I must try using buttermilk. Lovely photos. These are beautiful, Debl! Truly I never met a biscuit I didn’t like. I was raised in the South and saw all styles and forms of biscuits. There is no one single right way to make them. There are so many variations from cook to cook and I think it’s fun to taste and see the differences. These look great – and are basically scones, right?? I’m never quite sure of the transatlantic translation. I love making scones and have a great old grandmother-approved recipe, but it’s not a very easy dough so this recipe is going on my to make list. But FIRST I am making a trip to New York next week – and even though your book is now available this side of the sea, I’m excited about going to a bookshop and buying myself your book, as my souvenir! Thanks so much for the blog. LOVE! Oh, I love biscuits, and I really love that you’ve scaled down the recipe. How I ended up being the only one in our family of six that loves biscuits is beyond me. No one to share them with! I’m excited to try this recipe – usually I make one with heavy cream as the fat/milk combo and they’re crazy-good. I’m a sucker for buttermilk though – and butter, so, yeah – these should hit the spot! The first thing I thought when I saw this recipe was, “Gah! Deb and I have the same rooster bowl!” (I actually had a set of 4 nesting, but am sadly down to 2). The second thing I thought was, “Biscuits!” I’ve made the Clinton Street Baking recipe, which is quite good, so I’ll have to try yours to compare. Nothing like a snow day to get us in the kitchen playing with butter and flour! I’ve been making these since you first posted the chive version – absolutely delicious and they freeze wonderfully so that we can always have “fresh” biscuits when a craving strikes. That bowl must have been standard issue to Jewish moms in the 1970s, eh? My mom is still clinging tight to hers. (There’s a whole set, by the way.) Purim shark, or just, I feel like being a shark this afternoon, thank you very much? I’m a bonafide southern girl so I just use self-rising flour (we don’t want to taste the baking powder) butter and buttermilk…but have to agree that making biscuits (and cornbread) is as important as it gets in the kitchen…Thanks for all your wonderful recipes…my son has been learning to cook and you are a go-to source for him. I live in Boulder and can testify that Dot’s Diner’s biscuits are FANTASTIC. They are my favorite breakfast place here – classic comfort food made by a kitchen staff that is part Nepalese, so if you go for lunch you will eat some excellent curry. I am so, so excited to try these! 2) I typically use a knife to chop the butter into the dough until the butter is in pea sized chunks in the flour, then add the desired milk. And most important using a glass IS the best way to cut out a biscuit!!! :-) P.S. I love your site!! These look amazing! I will trudge home through the slushy streets to make them right away! May I ask where the wooden dish is from? I had dinner at a wine bar last weekend and they also used them. I love the way they look. I recently saw a biscuit recipe [Tupelo Honey Cafe’s famous biscuits] that asked you to freeze your butter and then grate it, frozen, on a cheese grater. My hardest trouble with biscuits and pie crusts is getting the butter appropriately small enough while still letting it be “bits” of butter. Do you think the shredding butter suggestion would work with these? Grating the butter — I have heard a lot about this technique (from you guys!) over the years and it sounds brilliant. Personally, it’s not for me because my hands are so warm, the butter is mush by the end and it makes a mess. I imagine it might also work to use a food processor to mix the dry ingredients, switch to the grating blade then stirring in the buttermilk (in a bowl). But given all of those parts you’d end up using, it should be little surprise that I prefer to use just my pastry blender and one large bowl (that I also use to weigh ingredients). Wooden plate — I don’t remember where I got them but I’ve seen them at a lot of kitchen stores. Definitely helps to oil them from time to time, and only wash them with a damp cloth. I think they’re bamboo, so a bit flimsy. They look so light and fluffy! Delicious! These look great, Deb, and not terribly dissimilar to the basic formula in Bittman’s “How to Cook Everything,” which we eat with dinner probably once a week. I often take his suggestion on flour-swapping and use half AP, and the other half is some combination of whole wheat pastry flour with a tablespoon or two of buckwheat flour, flax meal, or anything else I have around. Certainly not traditional, and a bit denser than ideal, but I don’t hear any complaints about them! So excited to see this post! I too stumbled across Dot’s Diner’s biscuit recipe on Epicurious years ago, also having no family biscuit knowledge to draw upon as a New England native. I loved the results, and knew it was a winner when my Atlanta-raised friend converted to using this recipe. I’m so glad your research confirms my experiences with it being a classic. In addition to being delicious, they’re so easy! I recently made mini-biscuits (cut-froze-baked) for a birthday brunch, and served them with spiral ham and a choice of strawberry jam, dijon, or caramelized onion jam. Yum! This dough sounds like an awesome candidate for savory tarts. I was going to try an onion tart this weekend, and will definitely try it with this dough. Will add a homemade kefir instead of buttermilk. This is my favorite biscuit recipe, too! And I was just on my way to the store to pick up some buttermilk so that I can make them this weekend. (I made a giant vat – make that TWO vats – of marmalade yesterday, then realized that I have not a crumb of bread in the house…) I do them as drop biscuits, but your photos have me curious to try cutting rounds instead. Have a great weekend, Deb. Another great recipe Deb – will be giving the, a go this weekend for sure! Was excited when I saw the Pyrex bowl – I have two of the same vintage in green. Love using them for just about everything! I’m super-curious about the merits of store-bought buttermilk versus the ol’ lemon-juice-curdle approach. Has anyone noticed a difference or have a preference between the two when comes to a final product? I usually use the fork and knife to do my cutting, because I gave away my pastry cutter years ago. I’d try the food processor, but it is my least favorite dish to wash.
I’ll have to try these. My mom’s baking powder biscuits are my go to, but I am always available to try new things as long as they are carb based. Yum! And I imagine that the buttermilk biscuits, especially with a little dial up of the sugar would be a perfect base for strawberry shortcakes. Oh my, haven’t made biscuits in years. But they are one of my husband’s favorite foods. (Especially if served in an Idaho diner with pan gravy.) Will try them this weekend. Thanks! Somewhere I learned to grate frozen or very cold butter instead of using a pastry cutter. I find it to be AWESOME. Have you tried this? And do you think it would work for this recipe? these look wonderful. As a Jewish girl from Toronto, I also don’t know the first thing from biscuits and am happy to learn – and to figure out how these might be different from scone recipes I have. About a month ago I was researching buttermilk biscuits like it was my job. Got totally overwhelmed with choices and just used my buttermilk for banana bread :) The biscuits look wonderful and I can’t wait to try them! The fact they’re your fave says it all! I ate my way through multiple hangovers on these biscuits when I went to college in Boulder. I can’t believe that a recipe for them has been floating around for so long and I didn’t know it. Hallellujah and GODBLESSYOU for posting this!! I cheap badly even on the wrong way. Since I don’t own a pastry cutter, I melt the butter or even use olive oil and just mix. Scoop and bake. So far no one has noticed the difference. I like the buttermilk recipe though and I’ll try cheating with it tomorrow. thanks! Scones! (Basically.) I haven’t tried this recipe yet, but just wanted (because I am a busybody) to emphasise the importance of mixing and handling the dough as little as possible. I think the main mistake people make when they start out is overkneading, because they just can’t believe that the dough’s meant to be that soft and sticky and still have visible bits of butter in it. Then they end up with a big biscuit (by which I mean a cookie) rather than a scone (by which I mean a biscuit). I pretty much just push mine together once it’s formed big lumps and knead it as little as possible. Oh, and also the best way to get a nice tall scone is to roll the dough thick so that your rounds are good and high. I find that increasing the leavening just makes the scones taste of leavening, without really increasing the rise. My name is Katy and I’m an Englishwoman obsessed with scones. Hi. This Connecticut Jew loves biscuits and gravy! I AM from biscuit country and you should feel proud of these! They are beautiful and I can’t wait to try your recipe! Thank you! That NYT article made me laugh so hard. My mother (the daughter of a southerner and a German immigrant) used to say that biscuits weren’t worth the trouble because it was impossible to make them right. Now I know why she always said that. I can imagine my grandmother looking sideways at my grandfather (who was a chef in Germany before the war) and giving him his bad news about the biscuits (my grandfather did all the cooking and my mother learned from him). Thanks Deb, for all the great recipes! I love your cream biscuits. They are what I make when we want something extra delicious. I imagine these will be just as tasty. I have the set of bowls, too, in lovely avocado green…so 70’s, but those bowls are very easy to use…light, nice shape, and easy to clean. The spouts are so workable that I am surprised that no company has copied them. Your blue looks pretty chic, but my avocado sort of hides out in the cupboard! Perhaps, retro is the best I can say about them. I’ll make absolutely anything that includes buttermilk. These biscuits look flaky and so wonderful! Hi Deb, If you use milk and sour cream instead of buttermilk, what are the proportions of each? By the way, I live in an RV with a samll kitchen and make your receipes all the time. The cookbook is the best! These look perfect! Like they could be the photo in the dictionary under, biscuits, U.S style…My own biscuits improved dramatically when I switched from adding liquid to yogurt instead. I ran out of milk one day and figured the yogurt would be liquidy enough and better than just water – and what do you know, it radically improved them! Wonder if it’s the acidic nature of yogurt and buttermilk and that’s why they work so well? As the granddaughter of a woman who–at age 90– still makes biscuits in her wooden bowl, I love that you posted a recipe for them. They need more love in the food world. If you want really beautiful layers, fold the dough repeatedly as you are flattening it. (i.e. Flatten it gently, fold in half on top of itself, flatten out again, repeat. The more folds, the more layers.) And my mom often makes a huge batch of dough, bakes whatever she needs for that morning, then adds a little extra baking powder to the rest of the dough, lets it sit a while and then rolls out more biscuits to freeze. It helps the frozen biscuits rise as nicely as the fresh-baked ones. BTW, I got my tickets last night to your talk in Louisville. So excited! I am always trying different biscuit recipes. The one I make the most is a drop biscuit with 2 cups (10 oz) flour and 8 tablespoons butter and 1 cup buttermilk. It was published in the Nov/Dec 2007 Cook’s Illustrated. I originally had to try that one because you start by melting the butter. Since I have a pint of buttermilk waiting I think I will try yours this weekend. Oh my. My very first comment on this site was on the chive biscuits from 2007. I couldn’t not comment because those Dot’s Diner biscuits were my first successful biscuit and are still my favorites…plus, I thought that alone made us (strangers) kindred spirits. Both are true (well, in my mind, anyway!) This biscuit recipe taught me that sticky, wet biscuit dough, folded over and over on itself, is how you get tender, fluffy and light biscuits. They are the best. As if the biscuits weren’t good enough on their own, you have to show that BOWL. My mom has one too but she still loves it so I’m not getting it any time soon. Biscuits and Pyrex nostalgia….thanks for the post. I hope you enjoyed your time in Minneapolis! I wasn’t able to attend your book signing, but a friend had you sign her knitting pattern for me. Thank you! Deb- your cream biscuits are so good that it is my go to recipe for biscuits. My husband loves them. But I will try this new recipe because you always have such great recipes. I made your blueberry muffins this morning but instead substituted cranberrys and orange rind, this is the best recipe. I freeze half of the recipe for later in the week such a treat fresh muffins. You are the best. I’m not a fan of the pastry blender and generally prefer to grate frozen butter, but the other method I love is to dump the dry ingredients onto the counter and cut the butter in with two dough scrapers. It makes you feel a bit like a biscuit ninja. Then you can just pile it up and add the buttermilk, mixing it right on the counter. Yay!! Saturday breakfast!! And maybe again on Sunday!! Thanks! I pulled this recipe out from its original 2007 post and copied into my recipe book about a year ago, and I’ve been making it for Sunday breakfast ever since. We love this recipe! Great idea to give it it’s own post. I, like a couple of the above uk commenters, am always a little (pleasantly) surprised to read a title containing “biscuits” and then see something more resembling what we in Australia call scones. Just made these – fantastic! Very similar to what we in Sweden would call scones (which are not like Brittish or American scones…). But, is there a way to get away from the slightly bitter aftertaste that I assume is coming from either the baking powder or the soda? These look really nice. In England we call them “Scones” and they are also baked with buttermilk! What we call biscuits are flat and crispy! All countries have their specialities and names which makes it more fun! Thank you for sharing yours here! I’m making biscuits this morning for a breakfast meeting with someone from the southern US (we’re in Sweden). I was going to tinker with a Swedish scone recipe and add in whole grain flours and things like that, but you’ve made me realize these are clearly the biscuits I should be making instead. Thank you. Your biscuits look perfect! Are they the same as English scones? Now I can see what Sandra writes above, they are. In Poland, we call flat and crispy cookies biscuits, these would be closer to buns. 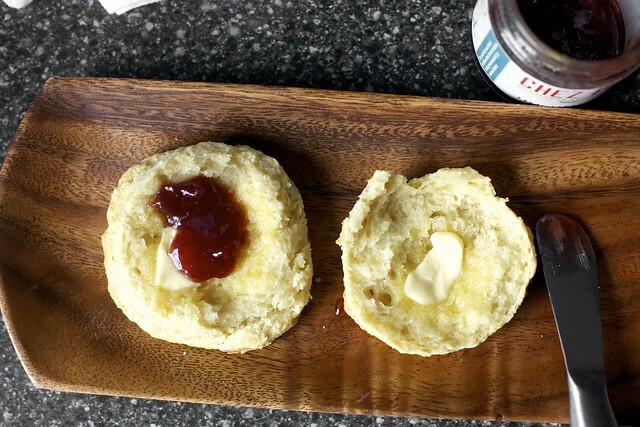 They are pretty similar to Australian scones.Down under we would use self raising flour and about 1/2 teaspoon of baking soda (bicarb soda) and about half the amount of butter then you would have the classic Australian buttermilk scone which are awesome with jam and cream. I too am in UK but used to live in New Jersey, so am familiar with biscuits being identical to our scones. Am always searching for the perfect scone recipe, so shall be trying these over the weekend. Amazed to see that bowl – I got one as a wedding gift in the 1960’s when I lived in East Africa. It had a metal holder to clip on the side, which held a smaller matching bowl, which I also still have. Not sure what that idea was all about! 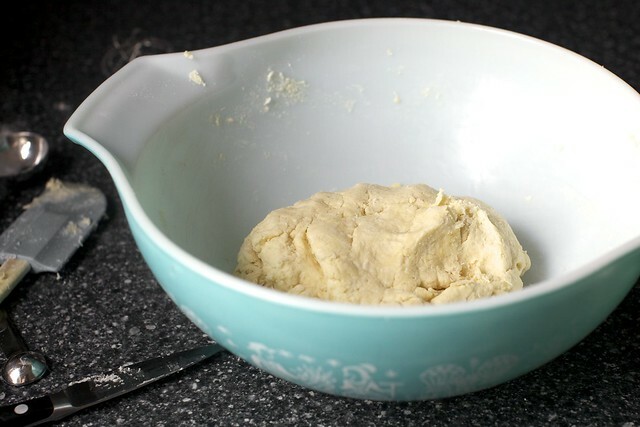 I have almost that exact same Pyrex bowl…inherited from my very southern grandmother who DID make biscuits in it. I love the white interior or mine, and the different sized “handles” that both act as a spout. Your biscuits look GREAT…the are one of my favorite foods! I love this whole post so much! First of all, my mom had and now I have that bowl!! It is huge and turquoise and I love it- it sits in my cupboard and I think of my mom several times a day when I see it. My mom (talk about the “wrong way” to make biscuits) frequently made hers out of Bisquick!! GASP! lol. I haven’t used that product since before I got married in 1980, but that’s ok. The poor woman had 4 kids in 5 years, if she wanted to make things from Bisquick, so be it! My own personal barometer for thinking I had good cooking skills was my mastery of using a pastry cutter!! I feel just a bit triumphant when I break it out of drawer in which it resides. I have been known to cut out biscuits from the rings for canning jars, or a dedicated biscuit cutter (depending on if my own boys had recently used the biscuit cutter for playdoh) or a cleaned out tuna can- any port in a storm!! Thanks for this recipe (and your blog)! I just made these this morning, but the biscuits didn’t quite rise up like yours did. Any suggestions on what I did wrong?? Hi Deb, do you think that this recipe for biscuits would be okay to use for monkey bread? Otherwise, do you know any from-scratch monkey bread recipes – most of the ones I’ve seen call for store-bought bake-ready biscuit dough and I don’t get those here in Australia. Thanks and these make me want scones for breakfast tomorrow haha. Um. Nevermind. I just realised I’ve actually seen a from-scratch monkey bread recipe here! Taught me to never comment on stuff past midnight. planned to do some computer work this morning before my 3 littles woke. but this was the first email i opened. so now, 15 minutes later, the biscuits are baking up. food first. work later. mmmmm. perfect for a Texas saturday morning. It’s discouraging. . .you, a sweet, bright, 20-something Jewish girl from New York, a foodie for sure, but with so few years under your belt. 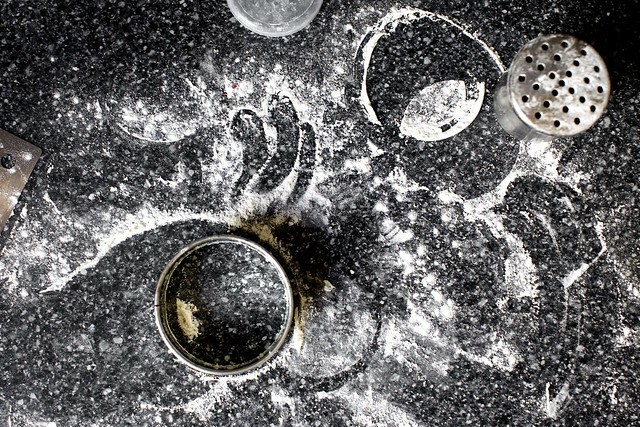 And me, an older (okay, old) foodie of 67 years who has cooked all of her life, and you teach me something nearly every time I come here; I never thought to use a shaker with a perforated lid to sprinkle flour on the counter, something so obvious! Thank you. I know these will be grand. I just made biscuits last night (not these). I got the recipe years ago from my mother-in-law from Maine, where biscuits are as popular as they are down south. They use a leavener called Bakewell Cream, instead of baking powder. But I always deviate from her recipe and use buttermilk and pastry flour, and it really makes a wonderful difference. Incidentally, if you want to go a bit healthier, you can use up to half whole wheat flour without compromising quality or lightness. Wish you lived next door–we would have such fun! My Grandmother made awesome biscuits ! They were ALWAYS cut with a Carnation Milk can, that she had carefully cut one of the rims off of, for a sharp edge, and punched holes in the top, so air could escape. Then, when all the biscuits were snuggled on the pan, with their sides touching, she would pour a little evaporated milk into her hand, and pat some on each of the biscuits before putting them into the oven. The resulting golden crust was incredible. She also made the same biscuits, adding enough sugar to the dough to make a really sweet tasting dough, baked them, and they were her base for strawberry shortcake. I recently did an estate sale for an elderly couple, (they were both in their 90’s ! ),and, when the Husband found out who my Grandparents had been, he totally surprised me by telling about a day,”when he was about 10 or 11 years old”, his Father had taken him to my Grandparents place. It was a hot day,(we’re on the Gulf Coast of Texas),and he had been served the most wonderful sweet tea, and strawberry shortcake, that he had never ever taseted the likes of again, his entire life. When I told him how she had made them, he was bowled over ! What a wonderful memory he gave me ! Thank you for your biscuit post. These look absolutely delicious! I’ve been looking for a good biscuit recipe, and these look easy and so tasty – thank you!!! Thanks for posting this. As a southern girl and avid baker, you would think I would know how to make a biscuit. Alas, no:(. So intimidating! I want to try this ASAP! Btw, I have tickets to come see you in Louisville march 27. My friend and I are huge fans! I would LOVE to “invite you over, please”, but can you fit in a visit to Arlington, VT with snow still on the ground for sledding and a Golden retriever to play with, and my 3-year old grandson and my 2-year-old granddaughter and a grand front porch, and a big kitchen for us to play in? It would be heaven for all! These look great and I’m definitely going to try the recipe. I have to suggest, though, that rolling & folding makes a fantastic biscuit. After the dough is made, I roll into rectangle, fold in thirds, do a quarter turn and repeat. I do this 4-6 times and I end up with mile-high biscuits with wonderful flaky layers. It’s not as hard as it sounds with terrific results. Works with any biscuit or scone recipe. Wait, I am 100% Jewish as far as heritage, and both my grandfathers were big fans of buttermilk: straight up with breakfast! This reminded me of a friends first try at making biscuits many years ago. You could have broken a plate glass window with them. I couldn’t figure out what she had done wrong because she swore she followed the directions on the box of Bisquick. Turns out she interpreted the “roll out the dough” as making a roll or rope. By the time she cut that into pieces the dough was worked to death and probably had too much flour in it. The devil sure is in the details. Aah! I went to Dot’s Diner many years ago during a visit to Boulder for a friend’s wedding weekend, and I still to this day remember how good the biscuits were — even though I couldn’t remember the name of the diner. This Southern girl is so, SO glad to have found this recipe. Thanks for posting! As others have said, for flaky biscuits, all you really need to do is fold the dough. When I make biscuits, I find it’s best to work with a fairly moist, soft dough, so it’s easy to fold. Oh, and yeah, I think most biscuit recipes are far too lean. Cut the butter into the flour, then add milk and stir to make a moist dough. (add extra milk if needed. Roll out fairly thin and fold the dough over on itself, and repeat several times (letting the dough rest if necessary so it won’t spring back when rolled). Cut with a sharp edged cutter (I think ours was a doughnut cutter without a center hole) and bake in a hot oven. Come to think of it, we made two sizes. Small, which we baked up crispy, more like crackers, great with soup, and larger, flaky ones, to devour with jelly or whatever else. My mom and dad would always take the last few (usually tough, re-rolled) scraps and make a cathead biscuit, but since I always work with a fairly wet dough, I can usually manage to roll out the last few and cut them as usual, making one last small one using a smaller cutter as a template for the shape. Cooking breads, rolls, and biscuits of all kinds are inspirational to me! These look fantastic and I can’t wait to try them! The smell alone must be heavenly! Thanks for the easy to follow steps!! My mother had a set of these Pyrex bowls. They came in graduated sizes and colors. I was seven years old and thought they were so “modern”. When I got married in 1964 I bought a set of BRIGHT orange Melamine (sp.? it’s a strong, light type of plastic). Loved them because they were light and orange was THE color in the 1960s. I used them to death and they lasted forever. I think I finally chipped one after 40 years. I now use a hodge poge collection of stainless steel mixing bowls. Some I found at Walgreens for $1 a piece. Two huge 6 quart bowls I bought at the supermarket for $6 (each?). Of all the different bowls I’ve used my favorites are the stainless steel. Like they say: The one constant in life is change. I wonder what the bowls of 2050 will look like? p.s. It would never have entered my mind that the Pyrex colored bowls from the 1950s would today be collectors items! All this freezing the dough/baking from the freezer talk is blowing my Southern mind. My family didn’t make biscuits when I was a kid but as an adult, I pride myself on mine. I am always open to a new recipe though and can’t wait to try these, especially after reading the comments. Does anyone care to reveal how they freeze their dough? Do you put the cut biscuits between wax paper or the like, and then in a Ziplock bag? I feel silly asking but the disappointment I would feel if I found them all freezer-burned and janky after craving fresh biscuits would be too much to bear. Biscuit Bliss! Couldn’t stop dreaming about these after reading the post last night (it was the gorgeous photos that did it) and now all that’s left are crumbs and greasy grins from all the locally churned salted caramel butter we slathered on top. (oh yes we did! from cascobaybutter.com) We used yogurt & milk in place of buttermilk, and a mix of oat and quinoa flours along with the white. Not quite as towering as yours, but crunchyoutside with pillowy layers of goodness inside. Thank you for the inspiration! The ultimate comfort food (along w/pasta of course)…and buttermilk for texture and flavor, along with minimal dough manipulation makes them perfect every time. Nice recipe! There ain’t nothin’ like a hot buttermilk biscuit. These look amazing. Totally putting them on my to-make list (I even have buttermilk in the fridge)! I love biscuits but I am definitely biscuit-challenged. I’ll give them a whirl. I made the cream biscuits and they are a fav. I also love the comments about the Pyrex bowl. I, too, have the same bowl. It was my mother’s. Now that there are no kids left at home, the bowl doesn’t get used as much because it’s the noodle dough bowl, cookie bowl, biscuit bowl, etc. Love reading about memories of the bowl and biscuits. It’s a universal love! My grandma made the best biscuits on Earth. I use all the same stuff but I can’t get them the same. Something in the way she held her mouth or arched her eyebrows that I’m not getting. These definitely look fantastic. Both of my parents grew up in the south, Georgia, and Florida, however, Mom made 2 types of biscuits, the small, thin biscuits that are rolled out and cut with a cutter, I think are known as party biscuits, perfect for little ham sandwiches and the like. The other is simply drop biscuits, that I think come from the Bisquick box. I know she made a fabulous cheese biscuit whereby it’s the same recipe, but added cheddar and parm cheese to the batter. As for that mixing bowl, Mom had the white with blue version of that set, though she got rid of hers as it was in terrible shape when she got rid of it 30 years ago but do remember her using the set though, and I think it’s made by Corning, not Pyrex. I have the Pyrex colorware set that dates to the 50’s that I need to use more often. But what I want to know is what is the speckled modern looking dinnerware you have (the lavender set) that seems to come in other colors too as I’m in need of new dishes, 2 of the four plates have broken, and one has fissures in it currently, and 2 of the 4 breakfast/salad plates remain, and most have at least one chip but do have all four bowls and mugs though. I have never been a dough cook. That was my mother’s realm, so I did everything else but that (and ironing.) Remember when people sprinkled their clothes and then had ironing day?! Yikes… Anyway… I need to know – do I roll out the dough as many describe? You use the word “pat”. I am not sure how to translate that when you are working with a ball. Do I push and flatten? Knead and fold? Use a rolling pin? I like the big craggy kind. Kathy — I would freeze them, even for a short period of time. Once you mix everything, the baking powder is activated. Freezing slows it down the most so it will still work when you need it (in the oven). I meat pat it out, as in, instead of using a rolling pin. Biscuits are rustic. ciddyguy — Our plates are a mix of colors (but mostly a sage green that’s closer to gray, and probably does look purply in the cool afternoon light) from Calvin Klein, I think the khaki cargo collection; however they’re not being made anymore. Miriam — You might prefer to seek out a baking powder that is aluminum-free. Many brands are these days, and it’s usually noted front and center on the canister. By the way, do not use sugar. Sugar is an abomination in both biscuits and cornbread. I love, love, love biscuits! I must have at least a dozen recipes for various iterations, but the one I go back to is the one published in the Iranian-American Women’s Club Cookbook that was my bible–along with “Joy of Cooking”– when I lived in Iran in the mid-70s. I was a good cook for my tender age of 25, but hadn’t packed any cookbooks. I will make these ASAP. ps–I still have fond memories of your signing in Santa Cruz and tell the story of that wonderful event to appreciative audiences. Hi I followed the instructions, however, the dough was dry and not all of it was incorporated. When I tried rolling it out flat it was hard to do and I worried that I had over mixed it. Any suggestions for how the dough should be? Oh, you’ve done it again! My biscuits have never turned out so good! Good writer, great recipes, super cook! I have been making biscuits from scratch from a small child as my grandmother taught me how to make biscuits at 7 years old. I make them somewhat similar to what you have here, with the exception of using self-rising flour instead of all purpose flour. I have not ever had success with adding the baking soda, baking powder, and salt. I DO have success with dumplings using this for my chicken and dumplings, so perhaps I will try this again. My grandmother would use whatever she had in the cabinet for the fat part, meaning butter or Crisco. My grandmother would also make chipped beef milk gravy to go with her biscuits. She would serve it up with sliced tomatoes, sliced cantaloupe in season, and sometimes scrambled eggs depending on the crowd she had to feed. This is totally wonderful Southern fare though.. so your mileage may vary where you are from. I know that if you love tomatoes, you will love this combination. I hope you will give it a try! @Marion #122 — your wedding present bowl was a Chip ‘n Dip! The smaller bowl was meant to hold dip, for the chips in the large bowl. Pyrex made lots of those in the ’50s/’60s… I can never resist buying them when I encounter them in thrift stores (charity shops). These were great, except for the slightly bitter aftertaste from either the baking powder or soda. Did I do something wrong? Can it be avoided? I have two sets of the bowls (one set was my husband’s Grandmother’s and the other I bought from a charity shop). They are fabulous for baking and so are excellent for making biscuits as they keep the butter cold. First of all, that CorningWare bowl just about made me cry! Second of all, when I saw that the post was about buttermilk biscuits, it just about made me cry! Now that I’m all worked up, I simply HAVE to make those biscuits. Thank you. Oh, and thanks for the tip to press STRAIGHT DOWN when cutting. I did not know that! Yum, yum, yum! Love the simplicity with the fabulous results! Made egg and ham sandwiches for the kids on these for lunch… Because I needed a reason to make them! My husband got a serving of your beer braised short ribs in top of one with the gravy poured over it! Soooo good! Oh, my — I just realized that bowl is Pyrex, not Corningware. My 1960s/1970s upbringing was all about Corningware, so one can understand my oversight. So nostalgic. All that’s missing is a set of Scooby-Doo drinking glasses obtained from the local gas station! I use two biscuit recipes depending on if I have buttermilk on hand or not. The one with buttermilk is similar but no sugar and the other one has flour, baking powder, salt, cream of tartar, butter and milk. Not really sure what the cream of tartar does, do you know? You can tell me when you are here in Louisville! Ordered tickets even before you announced it! So excited! Will the drop biscuits from this recipe work as the dumplings in chicken & dumplings? I just drop biscuit dough on top of the chicken & veg stew & steam them, but I’ve been using Bisquick so would love to use a from scratch recipe like this one. Hey Marian – those two bowls you have are a chip and dip set. Little bowl for dip and big bowl for chips, or vegies if you’re being healthy. Deb – these look good, and I certainly wouldn’t turn one down if offered. However, as a Midwesterner living in AL for 25 years, I’ve got to say that the 2 secrets to biscuits are Southern flour and wet dough. I made plenty of biscuits growing up, but until I tried White Lily and a wet dough I didn’t know what biscuits could be. My easy biscuit is James Beard’s cream biscuits. I use White Lily, and the recipe calls for 1 C heavy cream to 2 C flour. That’s not enough: I add at least 2 T of milk to make a softer dough. Your biscuits sound great – very similar to my grandmothers. For all those who are saying that northerners didn’t grow up with biscuits, I grew up in Maine and my grandmother and all my aunts made mile high biscuits. In our family, Dad made the biscuits, the only thing he ever cooked. He learned how in the Army and never forgot. Better go make me some biscuits in the morning! So many memories stirred up by one simple recipe. I grew up in California, but both of my grandmothers were transplanted from Texas, so, yeah, we ate biscuits. One of my grandmothers had a deep “flour drawer” in her kitchen–I’ve never seen another one. Bruni’s comment (140) about misunderstanding “roll out the dough” reminded me of a friend’s story. Her husband said he needed to take something for a potluck at work the next day. She was busy, so she said there was a box of brownie mix in the cupboard and he could make them himself. All went well until he got to the instruction to “mix by hand.” As soon as he plunged in his hands he realized that was not exactly what they meant. This is exactly the kind of recipe I’ve been looking for to complete my breakfast ritual! Even though I have a bakery close to me, I still prefer to make these kind of bakes myself. Perfect for a late sunday breakfast! Picture perfect. Nudged my sweetie into making these biscuits instead of crepes… we were all so glad he did. They were flaky!!! And not too sweet… not too salty… simply perfect… and with his uncle’s homemade elderberry jam and some sharp 5 year old cheddar… mornings don’t get much better. We substituted one cup milk, half cup yogurt since we didn’t have any buttermilk on hand. I have been using this biscuit recipe for years, it’s my favorite too! When I have time, I put it together with a technique from Peter Reinhart’s Crust and Crumb. You leave larger butter chunks and fold the dough like a letter, then rest it in the fridge for 20 minutes, then roll out and fold like a letter and rest again. You fold it a third time, roll it out and cut your biscuits. The biscuits often rise to three times their original height, sometimes they get so tall that they fall over! It’s like a puff pastry biscuit. I would flatten them out and make duck confit flatbread with merlot. Until yesterday, my (wonderful) go-to biscuit was the Cook’s Illustrated recipe (very similar to this but with less sugar and less leavening). I made a version of these yesterday and they were perfect! For those who are wondering, I made three modifications: 1) I used the food processor as in the CI recipe (pulse dry ingredients, then pulse in the butter), 2) after removing the butter/flour mixture to a bowl, I added yogurt. With my homemade yogurt (slightly less thick than commercial), I used a full cup to get the right consistency), and 3) I folded the dough a few times as suggested by other commenters. Easy and fantastic– everything a biscuit should be! as always, a perfect turn out from your recipe. followed exactly. these biscuits out do any other, including the ones in your book. thank you so much. a writer and cook i can always depend on. ps, i think i ate all of them too! Woke up this early Sunday morning , saw this recipe and treated my family to some mighty fine biscuits. My father proclaimed them ‘Perfect’. Thanks! I used cake flour and weighed everything and used a cup of whole milk with vinegar in lieu of buttermilk. I will definitely make these again. can you substitute the buttermilk with anything else? Thank you! I have been looking for a new biscuit recipe! I love biscuits. So quick and easy to make! I make them to serve with dinner and as dessert with my sliced strawberries. Thanks for the new recipe! I swapped in 80mg of barley flour and they needed a little extra buttermilk but they turned out so delightfully nutty. As always, loving your recipes. So confused! Are “biscuits” really “scones”???? Here in Australia, a biscuit is what you would call a cookie, so are these “biscuits” really “scones” or “rolls”??? I hoe this is okay to post here. I made the butter blueberry cake from your wonderful cookbook this afternoon and am wondering whether the recipe printed is entirely correct. I checked it after the prescribed 35 min and it was still jiggl; it needed another 45. I know my oven temp is right, having set up an oven thermometer recently. I’m wondering whether there’s too much flour listed, or berries, or something? The batter was so thick when I scooped it into the pan that I’m really not surprised it took longer. My husband has been talking about biscuits for months because he just recently had some that addicted him so this recipe couldn’t have been more timely! I made them tonight and we have officially included this in our list of staple recipes in our household. we had them with local honey. we had them with sausage gravy. we had them plain. I did what others suggested and tried them folded for flakiness and i also spoon dropped some. they were all yummy but the spoon dropped broke apart differently, i would eat those plain or with jam versus the folded which we ate with sausage gravy. so good! American biscuits are very similar to British scones, and were probably born out of the British scone during colonization. Though biscuits can vary in texture, I liken them to slightly less crumbly scones; they tend to contain more leavening than scones, therefore have a bit more rise to them. I’m pinning them and they look awesome, but I really just wanted to say – oh! that bowl! I grew up with that one and my mom still has it :) Bless her heart, I can guarantee the only biscuits made in it were of the Bisquick variety! Loved how you identified so many of the quirks of biscuit cooks! I only started to make biscuits again after the first time I made them for my new husband that were not light and fluffy! Hockey pucks were more like it. And I am a southerner and my mom made wonderful biscuits at least once a week or more! So I have mostly avoided them until recently with mediocre results. Can’t wait to try this recipe. Yes, we have two of those Pyrex spout-bowls, of different yet complementary shades of avocado green. And proud of it. These are epic. One question. Can you put cheese in them? Oh biscuits! I am so craving for some to be had with nutella and a dab of butter and jam. I’ve only learned how to make biscuits in the past few years…my Italian nonnative never made them! My recipe is similar..
Half the fat I use is frozen butter that I grate into the flour. I use buttermilk but self rising flour. Other than that we are along the se lines! Biscuits n gravy for all!! I feel ya, as an Egyptian Australian, biscuits (which we call scones) were no where to be seen in my household. Then I tried one hot and smothered with jam and cream and haven’t looked back since! It’s actually been a while since making my last batch in favour of healthier breakfast options, thank you for reminding me, these looks fab! I’ll have to try this recipe (though I just made your blue cheese-scallion version for dinner) – I’m always rather amazed at the sheer variety of flour:fat ratios I’ve seen in biscuit recipes. More fat certainly makes them easier to handle and tastes oh so good. I tried this recipe immediately on Saturday morning, full batch for my little family of two and a little two year old – the biscuits were all gone in the evening. Being from Germany, I had never made nor heard of this kind of biscuits before. Now that I’ve come back to let you know, I am impressed by all the memories this recipe (and the bowl) seem to cause. I really like this aspect of food blogs, that I get to know new recipes and bits of the culture they belong to, not only through the posts, but also through the commentaries. can’t wait to make these–and…i have that bowl! never seen it anywhere else before. i grew up learning to cook in it, and finally made my mom surrender it–love the handle/pouring sides. I hope you had a wonderful weekend! I missed this posting last Friday … as I was completely engrossed in your cookbook which I had just received as a birthday present (we made the wild rice gratin & it was delicious)! I will have to try these biscuits this coming weekend! I just finished reading Debbie Moose’s cookbook Buttermilk and have an even greater appreciation for buttermilk and especially buttermilk biscuits. Thanks! This is the biscuit recipe I have been making for over 30 years and it has never failed me. Love the idea of freezing the individual biscuits – makes them easy to prepare on week nights. As always, great recipe! So proud of you for making buttermilk biscuits, but being the good southern belle that I am…I almost fainted when your biscuits were not touching each other while baking. Bread is just about my favorite thing in the world, but biscuits take the cake. One Thanksgiving my brother and I had a biscuit eating contest to see how many we could eat (I won). These look sooo good! These look great. I just made the maple bacon biscuits (with turkey bacon) from your book and they were crazy good! I can’t wait to make them again!! I made these for breakfast Sunday morning. They were yummy. I had to add a little extra buttermilk to get them to come together but they were worth the effort. I’m completely enamored by Katie’s real buttermilk–actual leftover liquid from making butter. I’ve made buttermilk ranch dressing and buttermilk pancakes with it that have far outshone the same recipe with “cultured” buttermilk or the milk/vinegar or milk/yogurt versions. Funny, I felt like making biscuits this weekend too, and saw your post after I had made some GF biscuits to go with some chicken soup on Sunday. Cheers! Hi- I didn’t see anything in the comments on how to keep them soft for later. The fresh baked/warm ones were delicious, but once cooled they were REALLY hard. Any suggestions for storage on already baked ones? ( or maybe I did smthg wrong?) Thanks! Hi! I am new to your blog and just wanted to say how much love I have for your blue ceramic bowls. I had some buttermilk I wasn’t sure how to use up. This was perfect timing! They turned out awesome! Thrilled to see my Grandmother’s bowls in your post. I have the 4-piece set. Love! Take care of your bowl. Oh my goodness these biscuits were perfect! I used vinegar with milk for my buttermilk option vs. lemon. I think the vinegar reacts better with the baking soda (or maybe that is my crazy volcano experiment showing from childhood!). But seriously, thank you so much for this recipe – so easy and my husband is demanding more! The best thing about making biscuits “wrong,” is them STILL being ever so right. As a Southern woman; those are still beautiful. Oh goodness, I didn’t realize how much I miss biscuits until I saw this post (my doc informed me about a year ago: Congratulations! You are gluten intolerant). I will try these with gluten free all purp this weekend. Any tips for making these sans wheat flour are hugely appreciated! Made Them. Love Them. Making more to freeze!! Now I can but the cream biscuit recipe to rest for a while. THank YOu!! For Marion, and any others who don’t know what the small bowl and metal frame were for, the metal frame perches on the edge of the big Pyrex bowl, and holds the little bowl up. Potato chips go in the big bowl, and dip goes in the little one. Back in the 1960s, dip made from Lipton Onion Soup mix and sour cream was a “must have” for home entertaining. So exciting, especially if you got fancy ruffled potato chips that didn’t break so easily when you scooped up the dip. I don’t know what happened to my mother’s set of white and blue bowls, except for the largest blue one, which I dropped while making my grandmother’s doughnut recipe. I still feel guilty about this. Wow!! These are just like my mom used to make. They will be made many a time. Thanks! I just love warm biscuits! Thanks for the recipe! Last night I just made the brownie roll out cookies from your cookbook! They were fabulous!! I had issue with these baking in 15 minutes. I used a cup of whole wheat flour, and so it was slightly harder to tell if they were golden brown, but I took them out at 15 minutes anyway, and when I cut into one they definitely weren’t done. I put them back in the oven for about 7 more minutes til I thought they were brown enough..I’m currently waiting for them to cool off enough to cut into :). Hoping they’re okay now, as it was an easy recipe to make, and my 22 month old is waiting patiently ;). Just made them 10 minutes ago for breakfast. They are absolutely fantastic! Thank you very much for the recipe! We love biscuits in my house! Thanks for the great recipe!! As a Californian who moved to Georgia as a 20 year old, I understand not doing biscuits right. This is awesome. Thank you. There were sooooo fabulous! I have tried to make biscuits in the past and they always turned out to be little hockey pucks. I added fresh ground pepper to ours for a little savory taste. I made the larger 3 inch biscuits and baked them for 12 minutes on our pizza stone. They were flaky and so absolutely delicious. As a Southerner, buttermilk biscuits are served with most meals. They are great for with ham or chicken. Alittle jelly or honey makes a quick breakfast! thanks for the recipe. I love biscuits and especially with ham. A delicous breakfast. Thanks once more for this nice recipe. I can’t believe the coincidence. That Dot diner recipe is the only one I have ever used! But I’ve been thinking they only were for drop biscuits. (Silly me.) I’m so glad you enlightened me. I can’t wait to go buy a cutter and try this weekend. Someone commented upthread that as a New Englander, she didn’t have biscuit making in her blood…. I’m a New Englander, and biscuits like these are the only acceptable base for a strawberry shortcake! I’m looking forward to trying this recipe tomorrow. 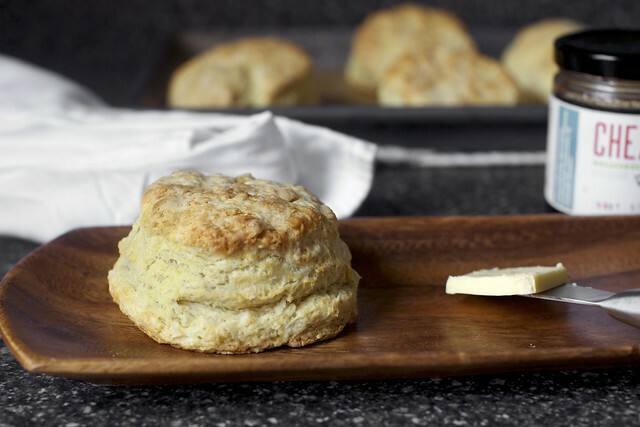 Oh how I wish you lived just down the street from me, especially with this biscuit recipe. I would invite you and the little one over for coffee – bring the biscuits and excuse the mess, I just had twins, and we would talk for hours about food. I read the article in Creative Loafing from when you were here in Atlanta recently, and it was a delightful read. I am enjoying your website and want to cook more once the twins are a little less hands on… (ha ha I know to the less hands on part). Oh, you should experience the aroma in my kitchen! I have these biscuits in the oven and I can barely wait the last eight minutes! I am taking a Food Photography course and needed a simple subject to shoot. I saw this recipe and thought that they would photograph beautifully with some jam on top to catch the highlights. Hmmmm, I wonder if there will be any left to photograph? Thanks for the inspiration. Your cookbook, in a beautiful stand on my counter, gives me inspiration every day. I made this last weekend, and they were a hit! Don’t tell m husband I have two stashed in the freezer. It’s a pregnant women’s prerogative. Quick, easy, delicious. And I wonder why I can’t lose the last 5 lbs of baby weight. Methods and what people consider “right” certainly do vary. But, hey, if you like them the way you make them, that’s all that counts. Your biscuits look lovely and yummy. We use Southern Biscuit (Tenda Bake) flour for biscuits. Like it better than White Lilly although WL is better than many. Although we use King Arthur for other things, it’s SB for biscuits! I cut equal amounts each of butter and Crisco into small cubes and pop them back in the refrigerator for about 5 minutes while I mix the dry ingredients. Mix everything by hand as I can feel when it is ready. I grew up with a mother and grandmother who made biscuits without recipes and just knew by look and feel when they were right. We always put the biscuits touching one another as we find that they rise higher that way. Someone up-thread asked about milk with lemon juice as a substitute for buttermilk. I didn’t read all the postings so I’m not sure if that was answered. In a pinch, I’ve used milk with vinegar (1T to 1C) in my biscuits and you really can’t tell a difference. It doesn’t always work as well with other recipes but it does work well with biscuits. Thank you Deb. That’s all I have to say after baking these absolutely perfect biscuits. Thank you so much. All your recipes I’ve made (and I’ve made quite a few) have turned out suberb. Which is even more wonderful if you know I live halfway across the world from you. This is why blogging was invented. But for now, thanks again. Really. Ihave that same bowl. It was my grandmother’s. I love it. Just made the drop biscuits and they were amazing! Thank you for another simple and delicious recipe. Couldn’t help but notice that you use mason pint jars for baking soda and powder. I do this as well. Your blog is so inspiring, by the way! Cannot wait to try these! I was just trying to decide what special treat I was going to make for my daughter Meggie after school tomorrow. Something out of the ordinary for her “double digit” birthday (10). I clicked on your site before turning of the light and there it was. The perfect treat that i will top with whip cream! She will love it! I just tried the recipe again…the dough was not dry, I folded it into thirds once and just barely twice then I cut out using a mason jar lid and just cooked…good flippin DIETY…they were soooo flaky and moist and no funny after-taste…just perfect! I used them in a peruvian eggs benedict dish I created :) Thank’s soooo much for the technique! So glad I came across these…I’ve purchased a jar of sweet pepper jelly and I’ve been buying cans of Trader Joe biscuits and they just aren’t the same as homemade! I’ll have to try these this weekend – thanks for the recipe and photos! Oh my goodness! My biscuits have always been dense, dry, and never risen. I don’t know what’s different about your recipe, but dang! These biscuits turned out perfectly! No more Pillsbury in my house! I love them! Thank you so much for sharing this! Deb, if you ever feel like you want a biscuit but don’t want to bake, Hill Country Chicken in the Flatiron neighborhood, has fantastic biscuits! I was just thinking about them and this I saw your post. I think this means I have to make these biscuits now. Made these at the weekend for lazy Sunday breakfast and they were WONDERFUL. Can’t work if the ones I froze are calling to me to be baked or having a party in the freezer alongside the woefully few remaining favourite choc chip cookies I made last week (divine). Regarding alternatives to buttermilk, I used a mix of milk and yoghurt in equal proportions. Fresh homemade biscuits really are the best, and so simple to make! Thanks for sharing your recipe. Thanks for a new post with even more pictures! Its difficult to find buttermilk in Mallorca (Spain). Is there any substitutive? I’ve been making biscuits for over 60 years and these are absolutely the best. I’ve always made great biscuits but these are amazing. My partner said, these are wonderful. Use this recipe for now on. I agree and thanks, Deb, you too are amazing. If I want biscuits the next morning, I will make them the night before, stopping before adding the buttermilk. I don’t have to measure before the coffee kicks in, and the ingredients chill together. On a totally separate note, I just made the plum muffins from the SK cookbook with the intent of using up three different charosets I had made for kids and parents to sample during a program I ran. The three had apples, prunes, poppy and toasted sesame seeds, dried figs and dates, oranges, cinnamon, a teeny bit of cayenne and cumin. My sons and I were so pleasantly surprised at the results. Thanks much! Love these! I just made these but with a slightly different technique. I’ll have to try this one as well to see if there’s any difference in texture but I found that using a bit of cake flour as well as AP flour made all the difference in producing a more tender crumb. I tried about 10 different variations on the classic buttermilk biscuit recipe before coming up with my recipe. You can see my technique at http://www.crumbsandtales.com/buttermilk-biscuits/ – thanks for posting ‘SK’! I woke up waaaaaaaay too early today, so what better time than this to bake biscuits? These are simply divine! Thank you. Lovely! I am going to use your recipe this weekend. I love the vintage mixing bowl. A friend gave me the same pattern/color of a casserole dish. I am in the process of baking challah right now with your fig, olive oil, and sea salt recipe. Blessings! My brother taught me a great trick, which is to flatten the dough to half the thickness you want it, and then fold it over and press lightly so the biscuit breaks easily into two even halves after it comes out of the oven. Well, if it makes you feel any better, my Protestant mother never made us homemade biscuits. Ours came out of a blue Pillsbury can. I am thrilled that you shared this biscuit recipe, though, because I have been to Dot’s Diner in Boulder and they truly make the BEST biscuits I’ve ever tasted. I’m usually not so into biscuits because white flour makes me feel bad but holy moly, those are worth it. They make their biscuits gigantic, almost as big as the plate, and just plop them right on top of the meals. So glad we stumbled upon that place when we were in town for my friend’s wedding! Love the recipe. Buttermilk rules! But I hate re-rolling scraps after cutting round biscuits. I divide original ball of dough into several balls. Press into discs and cut into wedges. End of story if you don’t mind wedge-shaped biscuits. The vintage pottery–love it! That is the one thing that is right here! My mother had a set of these and the various sized bowls were of various colors. It think it is still over in her house–stored away, of course. As for the biscuits–all white flour–unhealthy. Butter/margarine–unhealthy. Baking powder–unhealthy! So its okay to enjoy once in a “blue moon” but not every Sunday. It worked! Just made them for breakfast and they came out perfectly–and I followed your recipe to the T.
I married a Southerner, and while I’m a fairly competent baker for some reason my biscuits always came out too hard, or never rose, or otherwise failed. I’ve literally tried a dozen recipes and even used Bisquick on occasion! All to no avail. Until now! This New Yorker (and her husband) thank you profusely! Oh golly…can it be?? This is almost the same recipe that I learned as a child from my grandmother on the family ranch in southwest Colorado! The picture is what initially caught my eye….they look exactly like the biscuits that pop out of my oven on a regular basis. I have tried a myriad of other recipes, but not say ‘home’ to me like these! I adapted this recipe many years ago to a scone and got rave reviews for them in the coffeeshop that I owned, Now, I bake the scone for a coffeehouse here in Oregon, and they sell out before the second round of coffee drinkers make it to the counter. Your site rocks, girlie! as a southern transplant living in a new england city, big fluffy biscuits with butter and jam are in my bloodline and i am drying up inside without them as non of the breakfast staples i’ve found here offer biscuits. and my own homemade renditions often fall flat (they don’t seem to rise enough?). will MOST ABSOLUTELY be trying this soon. i am wondering if you can tell me if there is a big difference between using real buttermilk versus its substitution (milk with a tablespoon of vinegar). perhaps that is my problem? Droooooool— need I say more? This has been my go to biscuit recipe since I started to trying to woo my southern boyfriend (now fiancee! it worked), by waking him with Sunday breakfast. You are right, Boulder is probably not ground zero for best biscuit recipes – but they are delicious. And I use a food processor (just a few pulses) and they couldn’t be easier! I am not good at making biscuit but this looks delicious I will try to make it and see if I will have the taste that I am feelingl by looking at the picture. Thank you for sharing this. Made six of these for dinner this evening and froze six more for later. Really tasty with a nice crispy edge and layered interior. Great way to use up left over buttermilk from the St. Patty’s day soda breads. Love these!! They are gorgeous!! Made these with plain yogurt mixed with a bit of milk. Used a little over a cup of the yogurt/milk mixture and they turned out awesome! Yay! I love buttermilk biscuits too and always enjoy testing out new recipes. Can’t wait to give these ones a go! Oh I can smell the aroma already just by looking at your tempting pics. Got to try your recipe! I made several batches of these biscuits and they are fantastic! I used a buttermilk substitute (regular milk + vinegar) and I subbed about 1/2 c of the white flour for whole wheat flour and it worked great. I will say that the first batch I used my trusty standing mixer because I felt lazy. The biscuits were fine. However, when I made subsequent batches using hand-kneading only, the results were predictably much better. I have already made these twice and my husband thinks they are the best biscuits he has ever tasted! He can’t wait for me to use this recipe for strawberry shortcake. Thank you for including metric measurements because in Budapest it is important. Diana — Did they spread? What size did you cut them to? They didn’t spread much at all. My biscuit cutter is 2 3/4″ and I rolled them out to about 1/2 ” maybe a tad thicker. They did taste amazing but they just didn’t look like yours in the pictures did. I tried not to handle them too much as I know they won’t be tender and flaky. Thanks for your help. Diana — Rise or spread? Did they stay flat or did they just not grow at all? Hope to help. I just made these biscuits this morning! I followed your steps, did not change one thing, and they turned out perfect! So tasty and very easy to make! HELP! I cannot make a biscuit to save my soul.. and while I had high hopes for these, once again, my efforts end up a near failure. They taste great, have a great crumb, but are as flat as they were when they went into the oven. Does anyone have an idea??? Why won’t they raise? I’ve been trying to use up the flour in my freezer since I’m planning to go on a paleo type diet but don’t want to throw good food away, so I made these biscuits with 160 g whole wheat flour, 40 g whole wheat pastry flour, and 80 g millet flour, and I threw in some brewer’s yeast for experimenting’s sake. I wound up using a bit more buttermilk as well. They were definitely not traditional biscuits and didn’t rise as much, but they were tasty with honey. The brewer’s yeast lends a particular flavor that I enjoy. You did not say how long to bake the biscuits. May I have original recipe. This is a great recipe, we love it. I did notice though that the biscuits I’ve frozen when I bake them, do not rise at all. I’m not sure if that’s because I ought to let them thaw or what. I have my preschool students who are preparing for Kindergarten make these (of course I handle all the truly hard parts like the oven), as a way to keep them busy but also get them involved in baking. They love it, it’s better than the Betty Crocker recipe we’d been using. My boss, who’s a total biscuit snob, LOVED these. Thank you so much for your recipes! This site is culinary inspiring, delicious and always a joy to search through! Thank you! Mary — The second to last paragraph has a baking time estimate. I just made these for breakfast – biscuits and bacon gravy. Yum! This is my first time making biscuits and your directions were super easy. I got 8 good size biscuits out of them. My 1.5 yr old who usually turned his nose at soft non crunchy type bread (it’s a texture thing) actually ate four bites. Thanks! 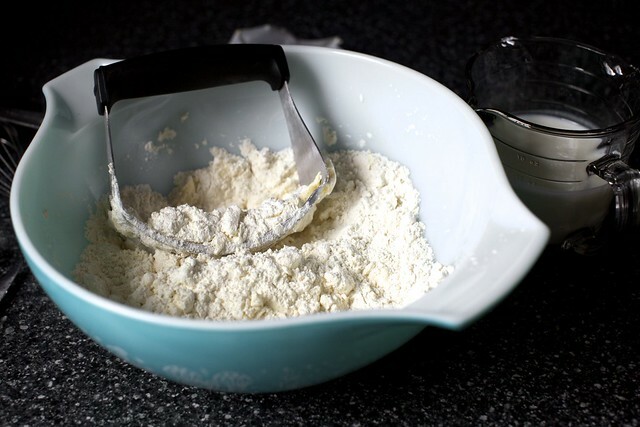 If you intend to freeze biscuit dough, you need to be sure you’re using double-acting baking powder. One of the chemicals in double-acting baking powder is activated by moisture, another by heat. I freeze baked biscuits. Zap them 45 sec in a microwave and they’re great! I’m a true Southern, but never have been able to make good biscuits. I just tried this recipe and they turned out fantastic. I’m freezing most of them and I’m going to use them like shortbread with strawberries and cream for Easter dinner. These look fabulous! I have to share that I clicked on the link expecting something entirely different as I’m Australian so to me these are scones and a biscuit is what you’d call a cookie! My most favourite way to have scones is hot out of the oven with a pot of tea, lashings of whipped cream, and strawberry jam. I’m quite intrigued by the idea of scones for breakfast with eggs and gravy! Fantastic! At 5 pm my hubby and I decided to make Easter dinner our way on Saturday since his family would be doing it their way tomorrow…we threw together a bourbon mustard glazed ham with a sweet potato, apple & bacon hash and I made these biscuits….mmmm mmmmmmmmmmm! And Jackson (my 22 month old) will love the biscuits freshly baked (I froze all but 4 as you suggest) in the morning. I think you are the best!! Tried making these today and it turned out fantastic! Thanks so much for the simple yet awesome recipe! You never cease to amaze me. Just took a couple of “samples” out of the oven in preparation for Easter dinner later – the rest are in the freezer. Amazing! On weekend mornings when I was a child my father made biscuits (and put butter and bacon on them, oh my). Sorry to say he should have had this recipe. Despite my fear of dough, and some scary moments when I couldn’t get it to hold together, these are delectable. Looking forward to making them a little sweeter to use for strawberry shortcakes this summer. These were great! I made them the day before Easter, froze the dough, and then baked them for Easter dinner (16 min). Like Mitzi, mine didn’t rise. I read in CI that biscuits should be baked immediately and leaving them standing will decrease the leavening power so perhaps A.A. Bruisee’s suggestion would combat that? Nothing was wrong with the taste, though, so next time I will probably just roll out the dough b/w 3/4″ and 1″ since 1/2″ was a little skimpy. We made these this morning and has the same problem as another commenter that they had a bitter aftertaste. They tasted metallic to me and just off in general to my husband. We used all the same ingredients we usually use and never have a problem with so I assume it was either the sheer volume of baking powder and soda or the mix of the two together. We also had to add more buttermilk just to get them to come together at all. Overall these were just ok. I think we will e sticking to our tried and true biscuit recipe from the Grit cookbook. Jill — Do you use aluminum-free baking powder? If not, seeking some out can really improve the taste (and get rid of that metallic taste associated with) of baked goods high in it. Just made these for breakfast with my son while on spring break. Holy deliciousness! Perfect biscuits. We ate them in slow motion, they were sooooo good! Thanks for a keeper recipe, I will be making them again. Omg Deb, these biscuits are amazing! They were so good on their own, I almost felt sorry to sandwich them with an egg. And they were really easy as well! I was making just 4 biggish ones, since I was short on butter, so I just divided the dough and shaped the biscuits individually. Having recently tried biscuits for the first time, I’ve been looking for a good recipe for homemade buttermilk ones. Thank you! Thanks for the wonderful recipe, as always! I have made many a-Smitten Kitchen recipes, all without fail… except this one. It wasn’t really a fail, but the dough was very wet and sticky, and the end result stayed as a lump shape and didn’t rise high with layers. The second time I tried it, the dough was similarly wet and sticky. But this time I lightly sprinkled the patted out dough top with flour, then folded the dough onto itself both width-wise and lengthwise, flattened it out again to 1/2″ thickness, and cut rounds. This resulted in a beautifully risen biscuit with layers, just like in your photos. I would recommend trying this method to any of your commenters that had a similar issue I had. Oh I forgot to mention that I also froze the biscuits both times, and baked from frozen. Only the second time did the biscuits rise. Again, it may have to do with the folding step. I made these biscuits this afternoon with my 12 year old daughter. She learned how to use a pastry blender for the first time. Each biscuit morsel turned out moist and buttery. Although not a southern biscuit, these biscuits were perfect for jam, honey or molasses! A LOVELY TREAT! Hi Deb! Have made these biscuits three times but have experienced the same problem as Diana twice– not much rise/puff. Didn’t really spread or flatten out. They seem to be losing a lot of butter during baking– butter is pooling around them, resulting in a chewy bottom. The flavor is there but they aren’t as satisfying (or beautiful) as a puffed biscuit. Any idea what I need to change/do better? Incorporate the butter more? Fold my dough before cutting? I would really appreciate any advice as I love these biscuits and want them to work. Thanks! Congratulations on winning the Julie Child Award on your cookbook!!!!!! Hi Deb! I’m a frequent visitor to your blog, but this is my first post. I’m going to be making this (amazing sounding) biscuit recipe quite soon for my boyfriend’s birthday because he loves biscuits and gravy. You mention your father’s sausage gravy recipe in the post–I’d love it if you post that sometime soon! It would be a great addendum to the biscuit recipe. These are some beauties. Biscuits are such a comfort food for me that this post is causing high cravings! I cheat instead of cutting individual biscuits, I make one giant biscuit. 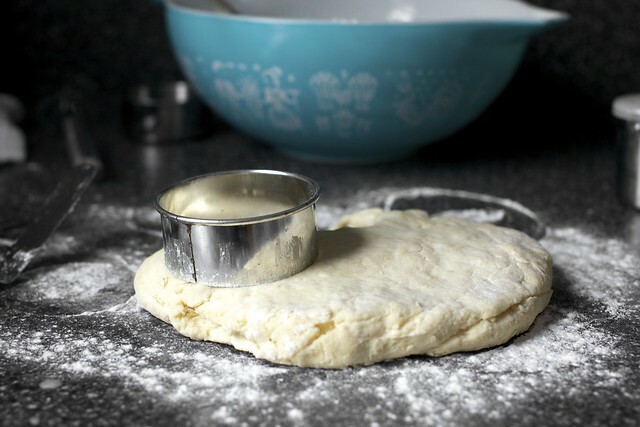 I still take the biscuit dough and put it on a floured board, then I take melted butter and pour it in a round cake pan. I then put the dough in the pan and flip it making sure both sides are covered with butter and then spread the dough out to the edges of the pan. I bake it at 400 degrees for about 20 minutes. Enjoy! Oh yeah I use butter flavored crisco instead of butter. I just ran across your blog for the first time just now when I visited Tablespoon.com to vote for my friend and neighbor, Hugh Acheson, for best chef. Having perused Smitten Kitchen, I’ve voted for it as the best food blog. Well done. Ah!! its look great. i think it will be a fun to make these tasty biscuits. i just want to taste it now as it is looking so delicious.Everyone should try this recipe its very easy and simple. That blue bowl is awesome. I’ve been to a few antique stores recently, and those things are everywhere! Selling for more than they did originally, I’m sure. Hey! That Bon Ap recipe is the one I use. You’re right – the biscuits are incredible and my husband is always “please, can you make some biscuits, please?”. Now that I know you can freeze them. . . thanks! I always drop rather than roll and I usually end up adding about 1/4 c more buttermilk. Thanks, but just a heads up, the cups to grams conversion for flour is way off, 280g = ~10 oz or 1.25c. Made some pretty gross biscuits using way too little flour. I have the exact same issue as SC with the flour. European and American flour must be very different. The recipe turns out great when I use 2 1/4 cups, but if I use 280 grams it is nowhere near enough. 1 cup of European flour is more like 140-150 grams so this recipe needs at least 315 grams. American cup measurements of flour can range from 120 to 145 grams depending on who you ask and how it’s packed into a cup (spoon and sweep, scoop and sweep, etc.) It’s just another reason that cups are a terrible measurement. I go with 125/130 because it’s what I get (fluff/scoop/sweep) but also should be a good middle to work with most recipes. Hi SC — The weight is correct. Each of my cups of all-purpose flour clock in at 125 grams or 4.4 ounces. Hi Deb, these scones come out perfectly for me every time! We have fallen in love with them and they’re so easy to make. Thank you! I just made these tonight and followed the recipe to a T! They came out nice and golden brown and smelled great. However the consistency was off, it was a strange crumbly texture when you ate it, verses a layered more biscuit-like consistency. It gave a strange flour-like flavor to it. I’m thinking next time I’ll either add 2 tbsp extra butter or do a milk/sour cream combination in place of the buttermilk as it just needs a little more density to avoid the crumbly texture. These are so easy my 3 year old made them last night!! One of my favorite recipes for getting kids cooking in the kitchen. Thanks! We found these off. We could taste the baking powder it tasted like the butter burnt. It was very strange. Thanks for sharing. I might use the recipe with lard and cut back on the baking powder a 1/2 tsp at a time until they don’t taste like it anymore. Nothing is better than a fresh biscuit! Made these as the vehicles for road trip breakfast sandwiches. They were great! I just made these using gluten-free flour and whey (leftover from making homemade ricotta) — they turned out very buttery and flaky! Thanks for the recipe! Thanks for the drool-worthy road trip breakfast. WHAT am I doing WRONG?! They JUST! WONT! RISE! they are fluffy, golden, SUPER YUMMY! But flat as a PUCK!!! I make my own baking powder, so I know it’s fresh, what’s the DEAL??? What about freezing the butter and than using a course grater over the dry mix.. This is my first comment on your site even though I’ve cooked and thoroughly enjoyed dozens of your recipes. First of all, the biscuits are delicious. I’d never made them from scratch, and they came out perfectly. My dad’s from Arkansas, and I know he would love these. With sausage gravy, preferably. But what I really want to say is that I also have a hand-me-down bowl like yours (same design but yellow), and I hadn’t used it in years until I made my first ever from-scratch pie crust last weekend (from your site, of course). I needed something that wouldn’t be ruined by the pastry blender and wide enough to get my hands in. That bowl is perfect! I also have a smaller one that’s white with a gold design. Thanks for the recipes and for making me love my vintage bowls again! oddball question: are they safely portable while frozen? should i wrap them individually? i’m going to a potluck brunch this weekend and would love to have them hit the table freshly baked on location. or is it wiser i bake at home and then pop in the oven on location to warm up before serving? mariel — You can transport them frozen but as soon as they start defrosting, they’ll start sticking to each other and losing their shape and… I bet it’s not worth the trouble. You could bake them before you leave, throw them in a basket with a loose cloth towel over them and they’d stay warm for some time. I generally do ok at putting good food on the table – thanks in no small part to recipes on your site and in your cookbook, but biscuits had been a challenge for me. No more! After initially feeling sorry for me that I was trying, once again, to make a delicious biscuit, my family agreed that I had finally succeeded – and without shortening!! Thank you! Just got around to trying these for the first time, and I won’t lie, these might be my new favorite biscuits too. I made biscuit/spinach/egg “sandwiches,” and although the biscuit “bread” wasn’t sturdy enough to eat out-of-hand while containing all that filling, it was all still incredibly delicious when eaten fork-and-knife -style. Had no problems convincing my 20-mo-old to eat his spinach this way! I NOW join you in a lifetime of biscuit failure looking for this success! I’ll be back! Just finished breakfast with your biscuits! I knew I would write to you about them being non edible. I was wrong NOW I no longer have to buy the frozen or canned biscuits…thank you ….for solving my lifetime of biscuit failure. out of white flour… could i use bread flour here? So, I cheat when making biscuits– I roll the dough out, then cut into squares with a pizza cutter. It’s faster, just as tasty, and totally the wrong shape. I am usually in a hurry, and get tired of cutting out the biscuits and then wadding the leftover bits together and hoping they make a decent biscuit at the end. These are so yummy! Honestly my favorite biscuit recipe hands down! I have also tried many a recipe…..these were delightful! Thank you for sharing:) I am going to eat more than I share, and going to have to exercise twice as much! It is worth it for a good biscuit! My husband keeps coming home from the store with Pillsbury Grands in the tube. I’m an accomplished baker so this disgusts me! I decided homemade biscuits will be my fall mission, so of course your site is the place to come. I find the recipe, and am impressed, then see that the recipe is adapted from Dot’s. I live in Boulder. The end. Except, (and I have no doubt these are great) if you can get the recipe for Lucille’s biscuits, from the restaurant of the same name, you may be a step ahead. Thank you, I can’t wait to halt the grocery store trips with these! I made a triple batch for the office Thanksgiving potluck and they were a big hit. I reduced the butter to make it an even 3 sticks and also cut the baking soda and salt by a few grams. I added sharp cheddar and scallions. The large batches rose less than the small test batch I made; maybe the oven temp decreased too much or something with that many frozen biscuits. Regardless, they still tasted great. I’m a southern girl, and grew up eating more than my share of all kinds of biscuits. This recipe was not my favorite, but produced a decent biscuit, nonetheless. A little heavy for my taste, closer to a scone consistency. I prefer shortening to butter. They were very tender, though, and tasted okay. Nothing to brag to your grandmother about, but served as a sturdy enough vehicle for my sausage. This was the first time that I have made biscuits and I thouroughly enjoyed it. I like that with every bite you get a little crystal of salt & sugar( not too much). I also am pleased with the fact that they have a “scone consistency” because they tend to be heavy and feel me up. So I can get away with making a very small batch. :D I’m glad that you shared this recipe and that I now officially know how to make biscuits. Bye! My first time ever making biscuits and I’m so happy I tried your recipe! Though I must admit, I had been looking at other recipes beforehand so I slightly adapted yours by adding a sprinkle of dried thyme, garlic powder, and cayenne to the dried ingredients. I also decided to go the cheesy route (per my husband’s request) and added 3/4c sharp cheddar to the mix. Once I did that, I found that the 3/4c buttermilk was not enough moisture to pull the mixture together, no matter how much I tried to knead. I added 1Tbs cold water and that seemed to do the trick. I just wanted to give you the heads up that the liquid might need adjusting if other ingredients are added. Otherwise, these behaved exactly as you described and were delicious!! Thanks as always. Do you think these will hold (in dough form) in the fridge overnight if I plan on baking them within 24 hours? I saw your freezer tip but unfortunately my freezer is broken in such a way that it freezer burns everything. Thanks! I got new biscuit cutters for xmas and made these the other day, they were great! Kate — It’s not ideal in the fridge because the freezer will keep the baking powder and baking soda from activating too much but the fridge will not. You will not get as much boost from the leaveners if they’re left in the fridge, but you will still get some. Love this recipe. Made the first batch step by step to the recipe but decided to tachle a gluten free option to share with my boyfriend’s family here in Australia who can only eat GF. Substituted GF flour and had to add a touch more Buttermilk but they came out just as great. They didn’t rise as much but were fluffy nonetheless, which was greatly appreciated by my GF dinner guests. I wanted to share the American biscuits I grew up on with my Aussie friends who keep calling cookies biscuits! Love this recipe, thanks for sharing it! These are so ridiculously good. I don’t even know what else to say…except that it’s a sinful recipe. It takes almost NO time to throw together (with things you already have around the kitchen) and the payoff is over-the-top. I turned some into bacon, egg, and cheese sandwiches, and the rest we had with butter and jam. Holy cow. Awesome. They have a wonderful texture, just enough of a sweet and salty bite. Love it. Wouldn’t change a thing. Thank you! Wow these were perfect with our lamb stew! Although I used your ratios more than your recipe and I didn’t have butter milk so I used half yogurt and half milk instead, I know Wrong, Wrong, Wrong!!! (or so the Jewish grandmother in my head told me, I am not Jewish but she lives there anyway!) At dinner last night I asked the family, why don’t I serve biscuits more often? They replied that I have never made a biscuit THIS GOOD before and I should continue! I just made these and while they taste and smell wonderful, they just didn’t rise. All my ingredients are fresh (I cook and bake so much nothing has time to get old) but they just didn’t rise. While that is fine for the batch I used to make chicken pot pies for my toddler, I like having flakey biscuits to eat with my jam. Please help! This biscuit recipe became my go-to the very first time I made them. I never keep buttermilk around, so I do the trick where you add a little bit of vinegar to regular milk and let it sit for a few minutes. These biscuits turn out amazing each time: flaky, buttery, moist, not too slaty. I’ve started freezing uncooked biscuits, so we can can have them anytime we want! Thank, Deb! This truly is the perfect biscuit recipe. Your grandmother may not have made these, but your granddaughter will! I just made them, and they were great (and that’s coming from someone whose mother, grandmother, great grand mother, and great-great grand mother made really good biscuits). Thanks for the recipe. I have tried at least 8 biscuit recipes in the last 2 weeks. This was exactly what I was searching for. I love that they are light and fluffy. Thanks you! My family loves these buttermilk biscuits! Hi Deb. I’m sure you have better recipes to tweak but when you feel like it you might try subbing cream of tartar instead of the bicarb. It’s not my idea but Nigella Lawson’s (HTBADG) and it makes a wonderfully cloud-like scone (I’m British, it’s a scone ;) ). I never understood how there could possibly be so many recipes for such a basic thing but every now and again something makes a difference and you say “Aha!”. By the way thanks for the bread-and-butter-tart-tatin-breakfast-heart-failure idea. Husband in raptures. I made this recipe to what I thought was the letter and they didn’t rise. I had a tray of tasty but flat biscuits. I used a pastry knife. Did I over mix? Did I under mix? Does god just hate me? Why!?!?! Michael — Tell me everything. First, what’s a pastry knife? Did they not even rise a smidge? Are you sure that your baking powder was good and that you didn’t accidentally use a flour with leavening already in it? Hope to help. Also, they didn’t rise or spread. I mean a four bladed pastry blender. I didn’t use self rising flour. The powder is new. They didn’t move very much. I think I may have over mixed. Ah! It sounds like you did everything right. They may have been overmixed or overkneaded. I hope it works better next time. FWIW, I’ve been playing around a little bit with this layering technique but I haven’t gotten it just right yet. It cannot hurt to add a couple folds here, though. Just one or two. I just did it again and they came out perfectly. Thanks. Less mixing. Just made these tonight!!! I drowned them in honey and devoured then alongside pan-fried chicken!!!! Ohmagawd, best biscuits I’ve ever made!!!!! Smitten Kitchen never fails me!!!! I made these and I found that they had a chemical taste. A tablespoon of baking powder seems excessive. I will try this again with a teaspoon or so. I’vebeen meaning to try these for sometime. Not sure what took me so long! They were super easy and delicious. You never fail me! Add sultanas and serve with a cup of tea oh by the way these are called scones here in Australia as well as the UK and New Zealand. That’s a terrible thing to do that to a biscuit! Made these for breakfast this morning and they were perfect! They taste just like the ones my Pappaw made when I was a little girl. Thank you! These biscuits are my favorites too! Discovered the Dot’s recipe years ago, and was tickled to see it as your favorite as well. I’m planning to make your SK cookbook cover recipe soon (yay August tomatoes) and I noticed that those scallion biscuits differ from these in a few significant ways–lots of powder and no soda, less butter, milk instead of buttermilk. How would you say the scallion biscuits compare in terms of fluffy/flakiness to these Favorites? I may have to make side-by-side half batches for comparison. Liz W — The book’s are great, fairly standard biscuits. But I like these more. You spoke above about not storing these, unbaked, in the fridge overnight. I’m going to a potluck next weekend, and would need to make them before we leave. Think they’d turn out fine after only a few hours? I’ve made them fresh before – absolutely delicious! – just want to make sure I’m bringing the same outstanding biscuits to share with everyone else. Yum! I had leftover buttermilk and wanted to use it. This recipe has moved to number one for biscuits in our house. Hi Deb! I want to make these for my dinner party of 12, is it ok to just double that recipe you posted above? I want to make ahead and freeze them! Thanks! I froze most of them in two large squares so I could cut and bake on Thanksgiving Day, but not before baking a few as a taste test. The verdict? Although delicious, my husband deemed them “too much” for Thanksgiving. I think he’s a party pooper, but I agreed to find a recipe for rolls. In the meantime, I’ve now got easy-bake biscuits in the freezer. I made these today for New Years Day 2015! Made them savory, added chives, topped them with Dungeness Crab, Poached Egg and Orange Hollandaise..the Biscuits were perfect.I did reduce the sugar to 2 teaspoons. My family loved them and my grandson cooed over them! Finally!! A biscuit recipe that didnt turn into hockey pucks!! Thank you! I even had exactly 3/4 cup of buttermilk. It was meant to be. I found this recipe about a month ago and have been making these biscuits on every snow day since then (10+) times. I’ve altered the recipe slightly, increasing the buttermilk to 1 1/4 cups because I like the dough a little wetter. Also, I increased the sugar to 2 tbsp because I like the biscuits a little sweeter to contrast with the savory bacon and eggs or sausage gravy (I’ve only made them for breakfast). Thanks, Deb, for helping me to better my skills. I fully expect my kids to brag about their moms amazing biscuits one day. My mom makes a beautiful, light biscuit, but these are a whole other level. Definitely more of a West Coast biscuit … hearty, slightly sweet, a meal in itself. Even the dough is delicious. AMAZING. Deb, I have had several serious illness over the last few years and have gone from cooking and baking all the time to not being able to get out of bed. I was a professional cake decorator in addition to all the baking and cooking I did at home. My family had to learn to adjust and I taught my kids many things growing up about cooking and baking. It got to where if we had a hot homemade meal the kids cooked it themselves or cooked it under my supervision. As a result there have not been homemade biscuits in my house for about 7 years. I have finally been feeling better the last few months than I have been in years. I woke up this morning craving my homemade biscuits and could not for the life of me remember exactly what was in my biscuits. I could remedy the ingredients but not the amounts. So, I did several searches on the ingredients I did remember, and finally found this recipe. The ingredients are the same, but the proportions were different, until I found the link to the original full sized recipe, and there it was… My recipe, divided by three. (I used to make BIG batches. So, I gathered my strength and dug in. They are done and taste just as I remembered! And my kids couldn’t believe it when they got home from school to one of their favorite things… Hot, homemade biscuits! I thank God for my strength slowly returning… I thank you for making my first foray back into baking a wonderful and delicious reminded of days past, for my kids and me. Hello,your favorite biscuits looks beautiful..When I bake I like to make them in bigger quantities so my question is; is it okay to double,triple your recipe ingredients? Thank you very much in advance.. I usually have good luck with SK recipes, but this one didn’t work for me. The biscuits did not rise (they didn’t spread either), although the flavor was good. I followed the measurements and instructions exactly. As a few others have mentioned, I may have needed to do some folding over of the dough before cutting. Also, I didn’t have the right size round cutter, so I used a small cup. It was easy enough so I’d be willing to try again with a better cutter and with the folding. I always love these recipes, but this one didn’t work out for me. I can’t figure out what I did wrong! Mine were like flat little hockey pucks. I followed the recipe exactly, but the dough was so crumbly and wouldn’t come together. I added a few more tablespoons of buttermilk, and even tried refrigerating it, but no luck. Mine didn’t rise at all and were too crunchy. Any idea what went wrong? I had the same issue about them not rising. I used fresh leaveners but found the dough wouldn’t really come together fully. Tasty hockey pucks. Sevtap — Yes, you can definitely scale this up. Jenny, Kippy — Sounds like a weekend of bad luck with these biscuits. I wish I understood why it happened. The dough is definitely on the sturdy side, but shouldn’t be hockey puck-like or crunchy. The usually culprits are butter that isn’t cut in cold enough or baking soda/powder freshness, but it’s not clear what happened here. Your biscuits look great!!! I love making biscuits too- well I love anything with butter. Keep up the good work! Deb, I’ve made these several times, and they’re always amazing (thank you!). This weekend, I made bacon for a summery salad and saved the bacon fat. My great-grandma used to do this, and I decided, why not. It could come in handy! Then I thought, what about using bacon fat to make biscuits? I had about two tablespoons, and I subbed them in for the butter when I made these on Sunday. Oh my. Have you done this? I know it sounds terrible, but as terrible and unhealthy as this seems, the biscuits were killer. I may not share them. Fun fact about these biscuits – they are AMAZING cooked in a cast iron skillet on a BBQ. These have just upped my camping brunch game, thanks so much Deb!!! So good. This was exactly what I needed this weekend. Do you use low fat buttermilk? The one time I got whole buttermilk it was so clumpy and thick that I thought that couldn’t possibly be what I was supposed to use! Beth — I do, that’s mostly what’s sold in cartons. And what’s sold in cartons isn’t “real” buttermilk, which would be more watery and not thick. I’ve been to Dot’s Diner (on The Hill) in Boulder many times, and their biscuits are to die for (especially with the house raspberry jam). I was thrilled to find the recipe in Bon Appetit a dozen years ago, and just as thrilled to see you also discovered them. It really is the perfect recipe. Deb, we moved to western Colorado last year (from upstate NY), and I was surprised how many restaurants serve bisquits. Sausage gravy, saw mill gravy, red gravy… And bisquits. Best sausage gravy and bisquits we’ve had were at a small town grange in Debeque, CO. All homemade.. Oh my goodness. I’m new to making biscuits…can you re-roll the dough to make more biscuits after cutting out the original ones? Paula — You can and should. However, the re-rolled bits always have a funnier shape. I have made these twice, and both times they haven’t risen and puffed up. What am I doing wrong? These biscuits easily were adapted using Cup4cup gluten free flour. This is the first time EVER-EVER that I have had a gluten free biscuit actually rise. They were fabulous right out of the oven with a pat of butter. I planned on serving them as a side, but I liked them so much, they turned into dinner. These were absolutely the perfect addition to our breakfast this morning. Thank you so much for all of your fabulous recipes! You save the day in our kitchen on a very regular basis! My brother wants me to make biscuits that resemble challah rolls. Should I just follow your challah recipe or do something to adapt your biscuit recipe? Noga — I haven’t braided biscuits before; not sure I’d use that approach. Handling them a lot will negatively affect flakiness. hi deb! for some reason mine came out flat, like snickerdoodles. where did i go wrong? thanks! ella — I haven’t heard of using a stand mixer for biscuits. Can you tell me more? i tried to incorporate this mixing method into your recipe. ella — Very interesting! I don’t see why it shouldn’t work with the KA as described, although there’s always more potential for overmixing/making more of a batter when using an electric mixer vs. by hand so it’s on you not to overdo it. How tall was your dough when you cut the biscuits? Did it seem like they rose and then flopped over a little, so they seemed flatter once baked? I want to have these for our Christmas dinner. But being that I will have plenty to do I want to know if they will still be good if I make a day ahead and bake them then put them in a airtight bag and heated the next day. They sound so good, but I just want to save some time by doing them ahead. Terry-I have made this recipe several times and when we have extras I put them in a bag and freeze them. To warm them back up I put them on a cookie sheet and in a 350 oven until they are warm. It works great and the biscuits come out tasting great and having the nice fresh crispy outside. I haven’t tried freezing just the raw biscuit and then cooking it, so I can’t speak to that technique. May I use a food processor instead of pastry blender or fingers to make coarse meal of butter and dry ingred.? Amy — You can, but I find that the FP makes it very easy to overmix the butter. I still recommend adding the liquid in a bowl or the bits get too blended in. These biscuits rock! No more hockey pucks! I do have a question…my dough was dry and a bit..umm..shaggy. The biscuits still tasted great and rose beautifully. Did I over mix or not incorporate the butter well enough? The dough was streaked with smallish pieces. Thanks! Rebecca — That might have been it, but it also contributes to the great height and texture. I raise pastured hogs and render leaf lard for my baking. The lard is Snow White and odor free. I use half lard and half butter for these biscuits, they are always delicious and flaky. They really freeze well too, which is great for the times when all the kids and grandkids come up to the ranch for a visit! I’ve been reading your blog for some time :) and I finally have a genuine question: is there a trick to baking frozen biscuits? Because I have done as directed by pretty much everyone – make dough, form, freeze, pop into oven – but what I get is a hockey puck with the butter oozing into puddles all over the pan. I’m not sure what I can be doing wrong, as it’s so simple, but help? Thanks! Re your new web pages – any idea why Evernote flames out and refuses to clip pages? No, but it is near the top of our list of things to sort out. We will get it fixed. I went to college in Boulder, CO – and although you didn’t name the specific “random diner in Colorado” – I knew in a heartbeat there could only be ONE PLACE… DOT’S!!! Truly the ideal biscuit that puts all other biscuits to shame. Plus, they’re always warm and really huge when you get them at the diner, and you can order them with butter and a side of homemade raspberry jam… OK, hopping on the next flight to Colorado, bye! I made these this morning, and I think I have an idea why some people are getting hockey pucks. My first batch, after mixing in the buttermilk, I poured the dough onto the counter and quickly formed a round, then patted it to 1/2″. I’ve always heard not to overwork biscuit dough so I barely touched it. With the scraps, I rolled, folded, and re-patted. What I found was that the biscuits from the scraps had some rise (nowhere near the pictures but some) but the others didn’t. No spread, never rose then collapsed, just never rose. So, realizing that the slightly worked dough from the scraps had begun to rise, I started again. When I poured the dough on the counter, I proceeded to knead and fold just a bit to get the dough to come together. The results turned out lightyears better, just like the pictures. In the instructions, you say to knead the dough slightly in the bowl before pouring it out, so maybe you brought it together better in the bowl than others (and me), but the problem seems to be when it’s not brought together at all, just patted down and cut. I see some others may have had similar experiences as well where working the dough a bit helped get the rise. This may be a case where fear of overworking the dough is holding people back from working the dough at all, which seems necessary. Just my two cents. Nice Jewish girl from New York who uses only organic ingredients was looking for some comfort food. Googled buttermilk biscuits and your best recipe came up. I was skeptical if I could make it halved as I’m a single mother seeking comfort not volume. Used what was left of an organic block of grass-fed 91% butter fat, some Vanilla 0% fat Swedish drinking yogurt, 1/8 tsp of Himalayan pink salt and my emergency packet of sugar in the raw along with organic all purpose flour, baking powder and baking soda. Used a fork as I don’t own a pastry thing. I didn’t fuss with extra flour or cookie cutters. I made 4 flat rounds about the height and spacing you recommended. I baked them on a non-stick cookie sheet as I was all out of parchment paper. And voila! 13 minutes to the most fluffy delicate melt in your mouth delicious biscuit’s ever. Great and easy recipe! Thank you! Thank you so much for this recipe. I only had one stick of butter and 1 1/4 cup of all purpose flour to work with so I substituted 1 cup of the flour with whole wheat pastry flour and accounted for the missing fat with a little bit of lard. They came out amazingly flaky and delicious. A little heartier, but I like that flavor with jam and it tasted great with apricot jam. Thank you so much! Hi Deb, I make these often and the results are always crowd-pleasing. I make a batch and freeze the cut biscuits but I find when I take them from freezer to oven I end up with overly dark bottoms. If I want to make ahead for a crowd.. how long do you think I can keep them in the fridge before baking? Made these for Thanksgiving. Very good. As a Southern woman, I have always felt that I should be able to whip up a batch of biscuits at the drop of a hat from the perfect recipe embedded in my DNA, just like my grandma could. And I can, sort of, but the resulting biscuits have never thrilled me. I went on a search for a new recipe this year and found yours. All I can say is, “EUREKA! This is it!” They are light and fluffy and replete with subtle deliciousness. Thank you for sharing it! When I peeked in the oven and one of my test batch biscuits looked exactly like the picture, I knew it was going to be good! Fluffy & delicate on the inside, good crusty texture on the outside. As written, fabulous savory biscuit recipe–just a little saltiness that would play off of other sweets perfectly. I didn’t have buttermilk and tried the vinegar + milk combo, but my kitchen may have been too cold, and it didn’t curdle. Thinned sour cream worked great, though I didn’t thin it enough at first and added half & half and flour until my consistency was right. Reading the other comments, my habit of folding dough as I re-gathered scraps may have added to this success! This recipe can be adapted to use a gluten-free flour blend…only use a blend, such as Cup 4 Cup or Bob’s Red Mill. Add one beaten egg to the liquids; you might need to reduce the buttermilk by 2 T to account for the egg. I also like to use thinned sour cream instead of buttermilk – just my preference. 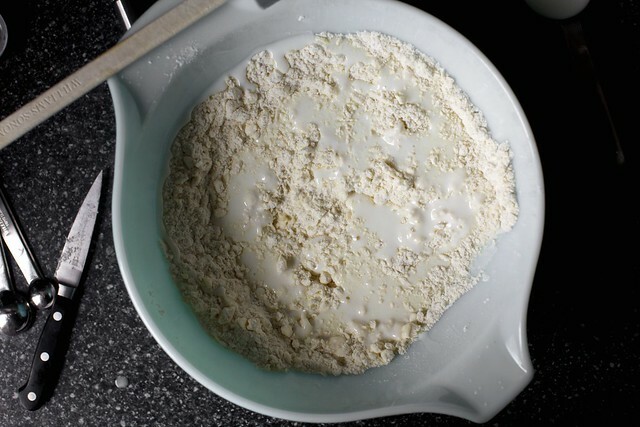 And, since gluten-free dough does not benefit from kneading, mix gently until the dough forms a loose ball, then turn the ball onto parchment paper and gently work into a flat square shape about 1/2 inch thick. Wrap the flat square and put in the fridge to chill one hour, then cut a grid of 3×3 which will give you 9 biscuits…separate slightly, to give them room to brown, and bake at 425 for 20 minutes (or a few more minutes if they are not brown to your liking. The resulting biscuit will be very buttery, tender, and more crumbly than a wheat biscuit…but if you have to avoid gluten, these will send you to the moon and back, I promise! Excellent recipe! Made them this morning with perfect results! Being from the south I know how to make biscuits but only two of mine looked like yours, the rest were flat and lumpy. I found the mix too dry to come together and being afraid of breaking the cardinal rule of not handeling the dough too much I pressed the dough together. Perhaps it needed a TLBS or so of buttermilk to help the dough along. I added Jaresburg but I think this choice of cheese didn’t help. Thoughts? These were quick and yummy!I always grate frozen butter,as it is easier to work with and produces a especially flaky biscuit. Going to give these a try > I have forever been trying to bake the perfect biscuit . They always come out like hockey pucks. I’ll follow this recipe to the tee ! Thanks! Made these wonderful biscuits with kefir…very tender. Will definitely be my go to in the future. My first go at making biscuits (NYC born and raised aka total Yankee) and they came out perfect. Better than some so-called Southern restaurants down here, if I say so myself. Thanks as always for the triumphant and unfussy (you should trademark that) recipe. You’re are always the solution when I get occasionally get mildly annoyed at Serious Eats for their technically fascinating but persnickety recipes. :) :) I confess I loved reading ‘triumphant & unfussy’ in the wild, and am glad the biscuits were a hit. My two year old daughter and I made these on Father’s Day. Made them in the food processor (the horrors!) to minimize the mess with said two year old. They were delicious! Perfect for a breakfast sandwich. Had one later in the day with butter and jam and it did not disappoint. Thank you for the recipe! These are SO DELICIOUS. I made them with some sausage gravy and oh my lanta, so good. I plan on making them again soon. Magic biscuits! I’ve had intense morning sickness, and these biscuits have kept it away! Now, I’m going to create a real Southerner. Thank you! These are now my go to biscuits. They are so dang delicious! Perfectly tender inside with a slightly crisp bottom from all of the butter. SK has done it again. Yum! You specify 400 degrees not the 425 degrees specified by Bon Apetit. Are you using convection oven? Or is there a reason for difference in temperature? I find they bake better at 400. I have some of these in the oven right now, but a gluten free version because I have celiac disease… I have high hopes! LOVE these biscuits. I wanted them for Christmas brunch this year so I doubled, formed, and froze. Very sad that the normal rise I get from them was not there (due to freezing). They were still delicious and everyone gobbled them up. I think I would reconsider baking from frozen again, though. That high rise is such a part of their charm. Definitely my go-to biscuit. Thanks, Deb. These are my favourite biscuits. I have made them both savoury with sharp cheddar cheese and sweet for topping with jam. They are all the things!! Make them and find out for yourself!!! My favorite biscuit recipe on your blog are the strawberries and cream biscuits. Out of this world! I am so lazy that I always grate frozen butter into my flour. Even for pie crusts. Works like a charm. I made this recipe two weeks ago, and sadly the “hockey puck” description was pretty accurate for what we ended up with. The flavor was still good though so I wanted to give the recipe another try at some point. Since our buttermilk was still good, I made round two this morning and they came out just like Deb’s pictures! I followed David’s advice and kneaded the dough a little more than the first time — still trying to be careful not to overwork it but making sure all the ingredients were fully incorporated (the first time, you could see a lot more of the pats of butter). I also had made them about 1/2 inch thick the first time so I was a little less conservative the second. So glad I gave it another go and can’t wait to enjoy the four that made it into the freezer (we got six total since I made them thicker versus eight the first time). Will definitely be making again! I’ve struggled with biscuit recipes over the years, usually I end up making easy drop biscuits. But Deb always convinces me to try her recipes, and I’m so pleased I did. These biscuits rose beautifully and came together with little effort. I took the advice of a comment (below) suggesting the dough be mixed pretty well in the bowl to help with ‘rise,’ it paid off! I was worried I was over mixing and making the dough tough, but it worked. I baked two and froze the rest. Also, I used SACO Cultered (powdered) Buttermilk, it lasts months and months in the fridge. These are amazing and, based on my experience, foolproof. I’ve been making them for years at home but most recently had surprising success making them in a toaster oven when a French-speaking Québécois airbnb host told us (doing his best to translate) that there was a “small oven” in the apartment. :) I turned the temp down just a little and they came out excellent, as always, alongside my friend’s amazing sausage gravy. Yum! Thank you! I made these for my office and they are picture-perfect…well, a couple didn’t rise as much. I just stuck those on the bottom. I’ve made these many times now, as well as sometimes adding flavorings, and I’ve never had the hockey puck problem others have described. My experience with this and other recipes suggests two things: one, that biscuits, while delicate, are substantially less so than pie crust and can be handled with less extereme care as a result, and two, that folding the dough to bring it together, as described here https://www.foodiewithfamily.com/perfect-flaky-layered-buttermilk-biscuits-tutorial/ , makes for the best rise and most distinct layers when baking. When I make scones which for some reason you call biscuits in America the only recipe I ever use now is the one from the Country Women’s Association (CWA). Their scones are absolutely legendary here in Australia and everyone knows the CWA ladies always make great scones as well as handcrafts, cakes, biscuits (cookies to you), jams, marmalades and other yummies. They also help out with charitable and other needs in the bush including being the ones out helping serving meals after natural disasters. I don’t mean to sound arrogant but I do make good scones and often find that when I buy them out I think I could have better ones myself. This is the second scone recipe I have used regularly the original one being the one from my high school home economics book. This surpasses it buy a mile and they’re almost impossible to stuff up in a mixing sense as they almost always come together well. Lemonade scones on the other hand I can’t get to work to save myself the mix always ends up too wet or too dry. Hope you enjoy trying them they’re delish. Preheat oven to 200° C. Grease baking tray. Sift flour, salt and sugar. Mix in milk and cream. Knead on floured surface and cut out with scone cutter. Place on baking tray and bake 12-15 mins. (I tend to try smallest one (usually the last remnants of the dough rolled into a ball) before taking out full tray and if still doughy leave a bit longer). Should make about 24 but the recipe can easily be halved. LOVED the flavor of these biscuits, but, mine didn’t really rise. What can I do to remedy this? There’s just too much baking powder in this recipe. It left a really weird aftertaste that I didn’t care for. Best to not eat the biscuits by themselves, unless you like the taste of baking powder. All that aside, I would use this recipe again, but definitely with less baking powder. These biscuits are SO GOOD. my one recommendation: freeze your butter beforehand (if you can remember to do so!) and gate it I’m using the large holes on a cheese grater. Makes them a lot better and less likely to end up as hockey pucks (which happened to me the first time, because I used fridge butter and I think I handled the dough too much and the butter melted). But no matter what they look like, they taste like Pure heaven. Flat but still fluffy! I was worried when I saw that the biscuits were flat and did not rise, but they were still delicious and had a good texture. Highly recommended recipe even if it doesn’t turn out perfect. Thanks so much for this easy and inclusive recipe- biscuits always seem so daunting but with this one I felt like I had the green light to forge ahead. The flavor of mine came out great but they were a little dry and didnt rise as high as I was expecting, given that you said your taller cut ones tipped over. I cut mine at a little less than half an inch. Wondering what I should try adjusting? Thanks! This is very close to the recipe I use. One thing to try, put the butter in the freezer for about 10 minutes, then grate it. The shredded butter works into the flour so easily that way. You win again! I added Costco Parmesan and it seemed to want almost a half cup extra linguists but they were great. Tender and flavorful. I made these today. Measured everything in grams. I only used the minimum of 10g sugar. I have to agree with the other comment that the amount of leavening agents is too much. While the texture is beautifully delicate inside and crisp on the outside, the aftertaste is a rather metallic. This is more apparent when eating the biscuits without any accompaniments. Made these a few times and they turned out so good. Crispy outer shell and slightly salty and deliciously buttery on the inside. I love that these are not dry and they are even tasty the next day if I leave them in a ziplock bag… usually the biscuits I’ve made previously have a dry starchy taste the next day, but these are gooooood. I froze these one time, but they turned out a little more crispy than I like because of the extra bake time, so I prefer making them right before baking. So glad I found this recipe… especially because my toddlers and husband really like it. WOW! I have a Pyrex bowl similar to yours but mine is yellow – found it in a thrift shop and use it for everything (didn’t know it was a prized item). My message is to tell bakers they can have an everlasting supply of buttermilk on hand if they just mix 1/4 cup into 3 and 3/4 cups of skim milk, let stand overnight at room temp., then use at once or chill for future use. I love this recipe, but I tweak the process a little and it’s yielded consistent results. 1. Instead of working the butter in until it’s a coarse meal, I stop once the butter is slightly larger than pea sized, I haven’t had a problem with this pooling or anything. I also use a method of cutting the stick of butter into cubes and smushing each cube instead of a pastry cutter. 2. When patting out the biscuit dough, I first pat into a rectangle, fold and pat again, then repeat twice. Making sure to handle the dough as minimally as possible. I find that this helps with rise and encourages flakiness.